Although it's been a month filled with sunshine, family visits and adventures in Northumberland, it's ended in a way that makes me feel very sad. So I'm keeping this month's intro short and sweet and although I know that things won't really be quite the same ever again, I am looking ahead to a brand new month and the start of Autumn. You wait forever for "one of those cool container sites" to open and then two arrive at once! Following the huge success of By The River Brewery on the Quayside, Stack has now finally opened at the Old Odeon site on Pilgrim street and it's so ridiculously cool I'm not sure I should really be allowed in there! An amazing site showcasing some of the best local businesses, shops, restaurants and bars it's quite a place! So far we've only had a quick mooch round but I can't wait to return and try it out properly! Let me know if you've had anything to eat there yet. A Love Letter to the A68! I'm not ashamed to admit that I am a bit of a loser but perhaps declaring your love for a road is a little weird even for me but I just can't help it. This month I've become completely obsessed with the A68! Seriously, the road up towards Kielder in Northumberland has to be one of the prettiest roads I have ever been on. Its high hills and hidden peaks reveal the most glorious scenery and the sudden dips and turns in the road makes my belly go wibbly. Every time we drive it we turn into big kids and yes we do start yelling "weeeeeeee!" as we drive up and down the dips. Don't laugh at me until you've planned an A68 road trip for yourself. I promise you'll get it. You know when you love somewhere so much and you mean to go more but somehow time slips away and it never happens? That's me and Cal's Own! Can you believe I hadn't visited since they relocated to Jesmond? I was stunned when I realised that they've been in their new place for over 2 years! As it had been such a long time I decided to go big with my order and dived straight into the epic calzone stuffed with mushrooms and goats cheese, I almost couldn't finish it ... almost! The highlight of our month had to be picking up our new wheels. It wasn't something we'd spent ages deciding on, Simon took our little Swift into the garage for a service and next moment he was test driving and buying a Suzuki Vitara. It perhaps seems a little crazy to make such a snap decision but we've found the very best decisions we've made in life have been a little spontaneous. We are loving our new car and are getting very excited about grownup things like the amount of space in the boot and having air conditioning. I have been stalking Dirt Health on Instagram for months now - the beautiful colourful dishes have really caught my eye so when I was invited to pop round for a little soiree for local bloggers I couldn't wait to finally taste some of their delicious looking food. I was absolutely blown away by what I had, the most tasty local produce lovingly created into perfect plates of food that not only taste bloomin lush but are also healthy! If that wasn't enough the staff there are so lovely that I'm determined to make them all my friends. I loved it so much I've already been back so expect a breakfast review very soon! If I had a pound for every time I've shared a photo from Scoop and Bean I'd be rather rich! The family came to visit us with our Niece and Nephew this month and we had the most wonderful weekend showing off the North East. Blessed with sunshine we spent the happiest afternoon at South Shields - riding the little train, skipping about in the sand and, of course, introducing them all to one of the best ice-cream cones in North Tyneside. They were very impressed, so much so our 7 year old niece has decided she wants to move here! Yesterday we said goodbye to my Grandma, and although she lived to an amazing age I still feel incredibly sad that she is no longer here. 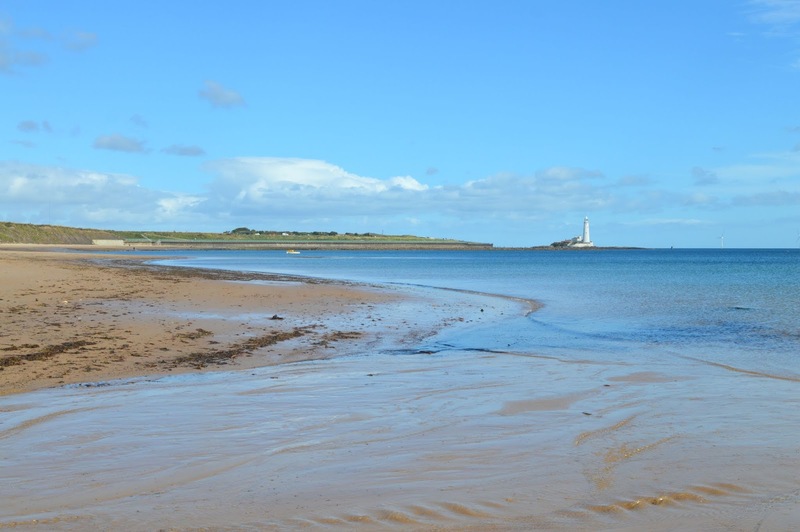 I'm not going to go into it too much as my blog is a happy space and I don't like to over share but on a day when I felt very sad the North Tyneside coast saved me. I spent the most beautiful day walking from Whitley Bay to Tynemouth and that time on my own strolling along the sand, people watching and dodging the rain showers went some way to make things a little easier. It's incredible how soothing the coast is and I feel so incredibly lucky that we have such a special place on the doorstep. For more adventures from New Girl in Toon make sure you follow me on Instagram. I post a new photo every day and you'll find video diaries of my favourite North East adventures on my highlights. No one would ever describe Simon and I as "cool" - we're big dorks who spend our time obsessively talking about the North East (me) or chatting to our friends on Xbox Live (him) - we don't care much about fashion, wouldn't have a clue how to dab or floss and can't sing along to any current tune on the radio - so when we set out to impress our Niece and Nephew with a day out in the North East, we knew we were going to struggle! Luckily Whitehouse Farm came to our rescue! When I think back to my childhood, my favourite relatives were those that took us out on amazing day trips - my affections easily bought, I favoured those who knew about the best playgrounds, bought me ice-creams and let me do things my parents wouldn't allow. With no kids of our own, Simon and I are desperate to be the cool Aunt and Uncle to Sienna (7) and Niall (3) and welcoming them to our home in the North East for the first time the pressure was on! I'd been wanting to visit Whitehouse Farm for a while but wasn't too sure if it was something Simon and I could do as a couple without any children so the arrival of Sienna and Niall gave us the perfect chance to explore the farm for the first time whilst scoring those all important cool adult points that we so desperately wanted. 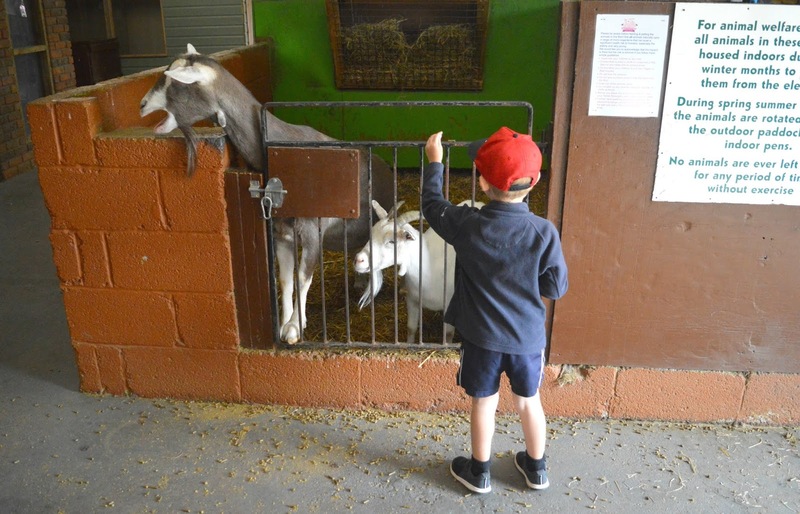 Whitehouse Farm is Northumberland's largest family run farm attraction, a few miles from Morpeth, the farm boasts an array of cute cuddly animals and mini beasts as well as plenty to keep the kids entertained including go karts, an adventure playground and soft play. It sounded perfect for our family day trip! When we arrived at the entrance to Whitehouse Farm we were given a map and information sheet with all of the timings for activities that were on during our day, realising we would just make the calf bottle feeding we managed to dash to the shed just in time for the kids to have a go feeding the adorable jersey calves before they finished their milk. There were two calves to bottle feed and both were greedily slurping their way through giant bottles of warm milk. 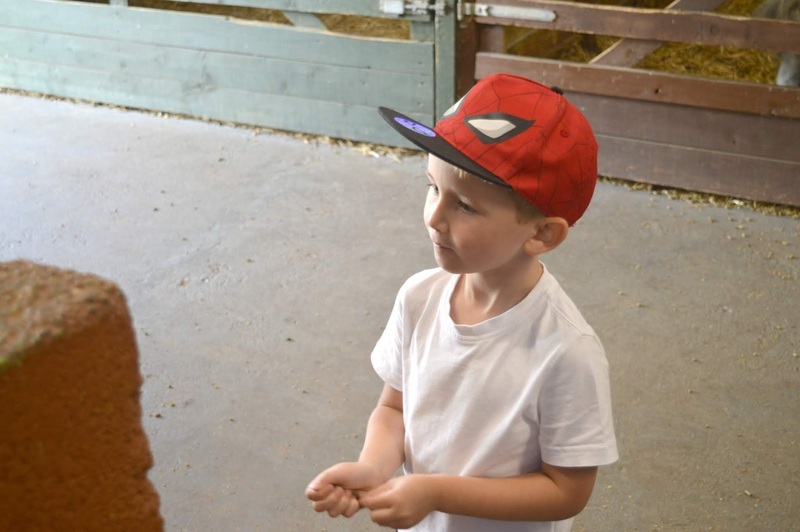 There was plenty of opportunity for the kids to get involved and the lady in the shed was so knowledgable about life on a farm and Jersey cows so we got to ask her loads of questions. 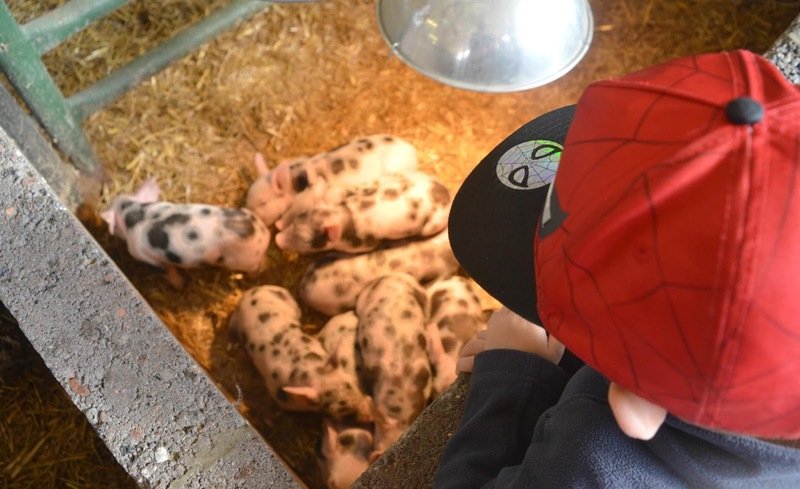 With the bottles drained of milk it was time to move across to the pig shed to say hello to the adorable piglets that had been born at Whitehouse Farm only a week ago. I just couldn't get over how tiny they were. All snuggled up under the heat lamp, there were loads of squealing little piggies with perfect little snouts and the most beautiful markings that we all had a coo over. I immediately decided to add "piglet" to my pet wish list. 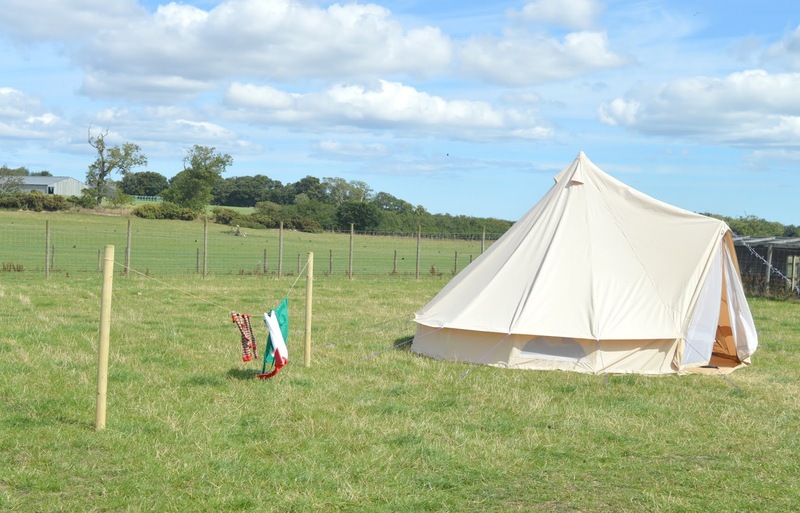 Dashing out of the shed into the sunshine, it wasn't long before Niall and Sienna spotted a very odd looking tent in the middle of a small paddock - with a washing line full of clothes and socks, and even an outside loo. It looked like someone had set up camp in the middle of the farm! Deciding to take a peak inside we let the kids go first and they couldn't believe their eyes when they peered through the canvas doorway only to be met by Santa and his Elf who were enjoying their Summer holidays in Northumberland. The kids were completely stunned as they took their seats and chatted to Santa. He checked his naughty book to see if they'd been good so far and they even got to submit their present requests early. With the kids hyper after meeting the main man we decided they probably needed to burn off some energy so we headed off for a play. There are so many fantastic areas at Whitehouse Farm for kids to let off steam. 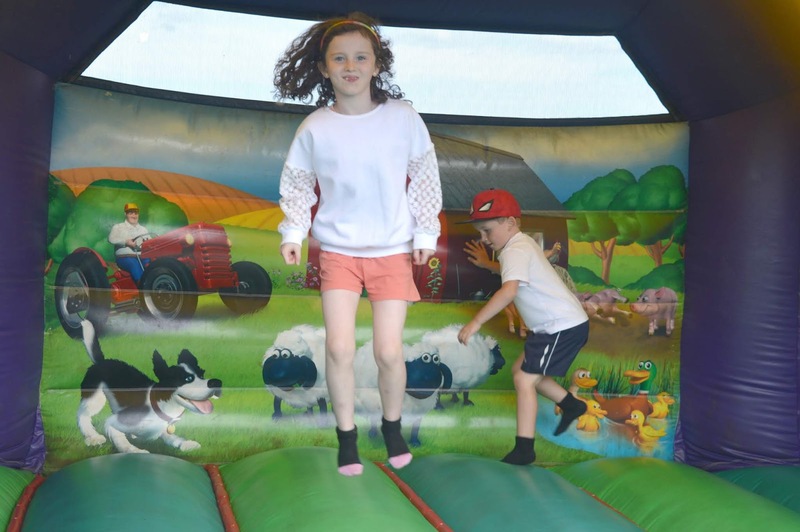 Bouncy Castles, Trampolines, Soft Play and an Adventure Playground. 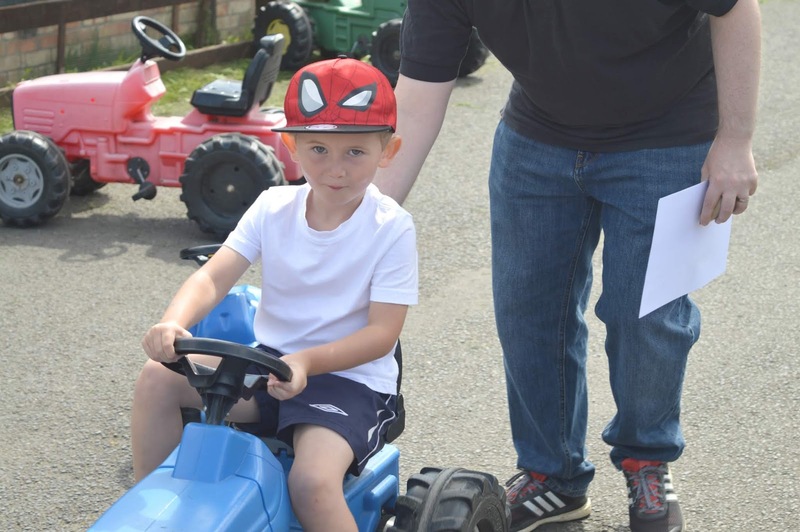 Niall and Sienna were particularly taken with the little pedal tractors in the courtyard and enjoyed racing each other round whilst the adults chatted in the beautiful Northumbrian sunshine. Luckily for us the pedal tractors were just outside The Whitehouse Farm Kitchen so it was easy to coax the kids indoors for some food, it was gone lunchtime and we were beginning to feel very hungry. The Kitchen serve hot and light lunches as well as catering for breakfast, morning coffees and cream teas. We were overwhelmed with the amount of choices we had and I was so impressed that the food is all freshly prepared using locally sourced ingredients. With our tummies satisfied if was time for another adventure and with Sienna announcing that owls are her favourite animals we decided to head off for the Meet The Owls activity. I had thought that we'd just be listening to a few facts about them so I was thrilled when we realised that we'd actually get the opportunity to hold a couple of them. 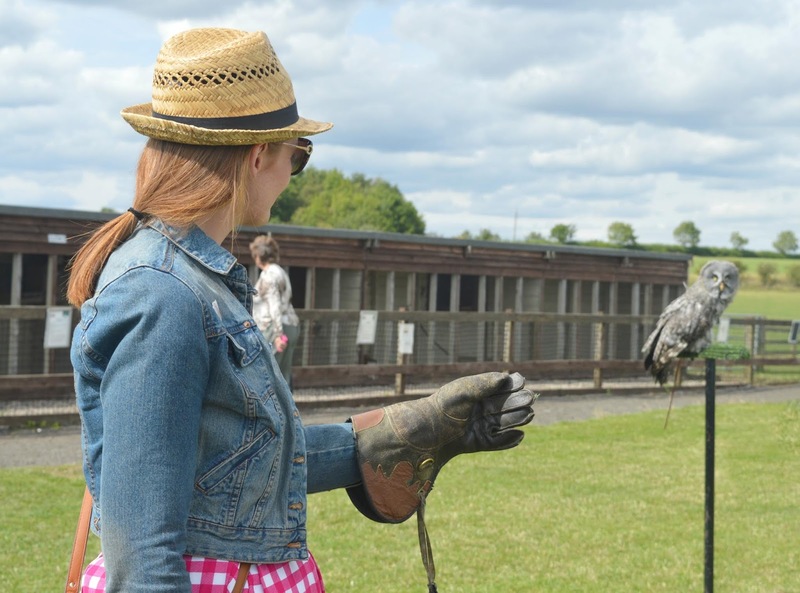 Sienna was over the moon when she got to put on a glove and Smoky, the huge Great Grey Owl flew over and perched on her arm. It wasn't long before there was queue of kids all wanting a go themselves and as I was happily snapping away at the beautiful bird I noticed my husband in the queue wanting a go. Not wanting to be left out I decided that I wanted to hold Smoky as well and it was such a lovely moment. 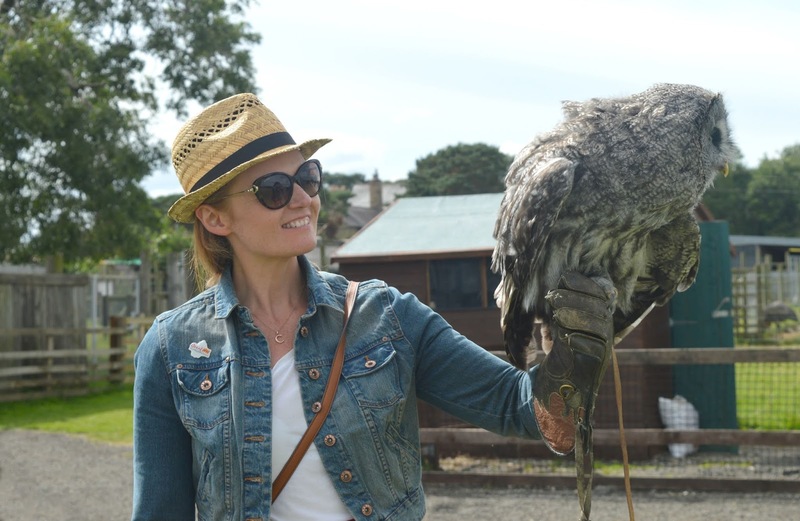 I've never held an owl before and I so surprised at how light he was - I couldn't believe such a beautiful bird was perched on my arm and I enjoyed a happy few moments with him before he flew back to his perch. 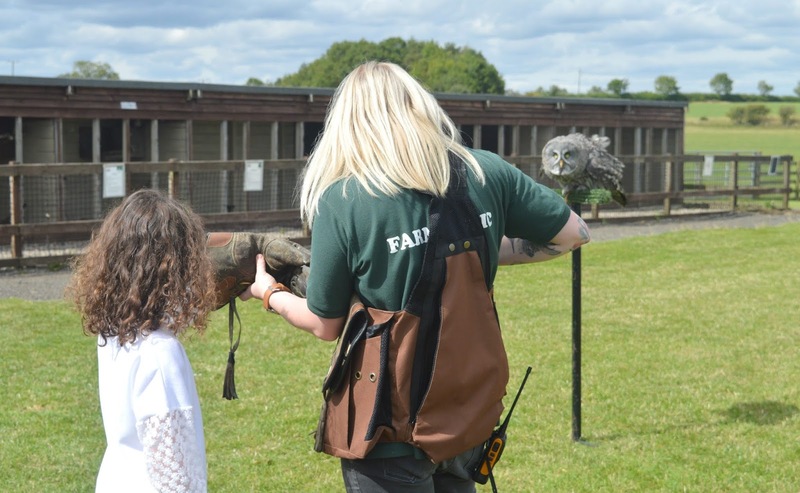 The big Great Grey Owl can be a little bit scary for some of the smaller children so once Smoky had had enough it was time to meet Boo Boo, a very cute little Boobook Owl. Niall decided that he was brave enough to have a go so put on a children's glove ready to meet Boo Boo. He was a little nervous when the owl flew over to him and for a second did almost run away but with a bit of gentle encouragement from the owl lady he managed to stand still for a photo and the look on his face afterwards was just amazing - we were all so proud of him for being so brave. Niall managed to conquer a few of his fears during our visit to Whitehouse Farm and after spending most of the day being very nervous of the goats his Uncle Simon managed to teach him how to get the animals to feed out of the palm of his hand which he loved so much he kept going back for more. Next on the agenda was a tractor ride around the farm and we all climbed enthusiastically onto the back of the trailer. Somehow Auntie Chloe managed to get the very back seat and after being warned that it was the bumpiest seat we were off! Clinging on to the back we bumped our way over the field for a short drive around and a quick hello to the cows grazing in the field. 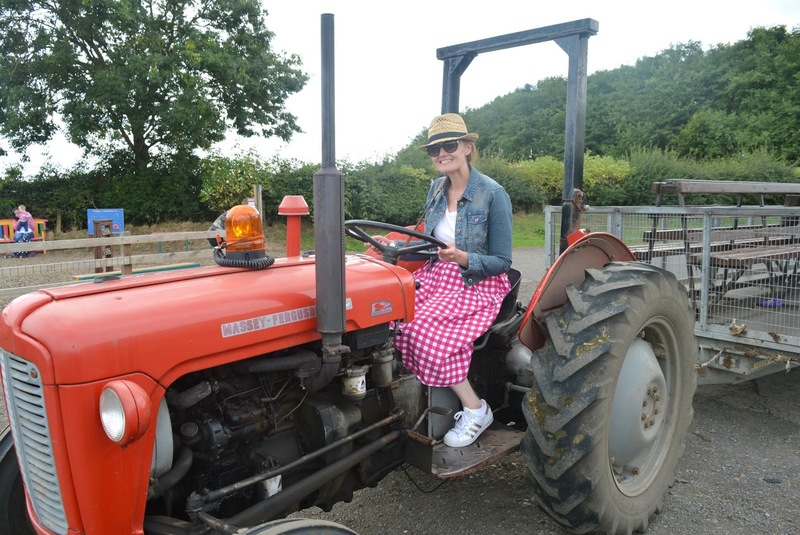 Once we'd returned to the farm we were very happy to discover that we would all be able to sit in the tractor for photographs after our ride. The kids all lined up to have a go and once the queue was gone I couldn't resist sliding into the seat for my own photograph. It's funny how a few hours at Whitehouse Farm and I really had rediscovered my inner child and wasn't ashamed to show it. 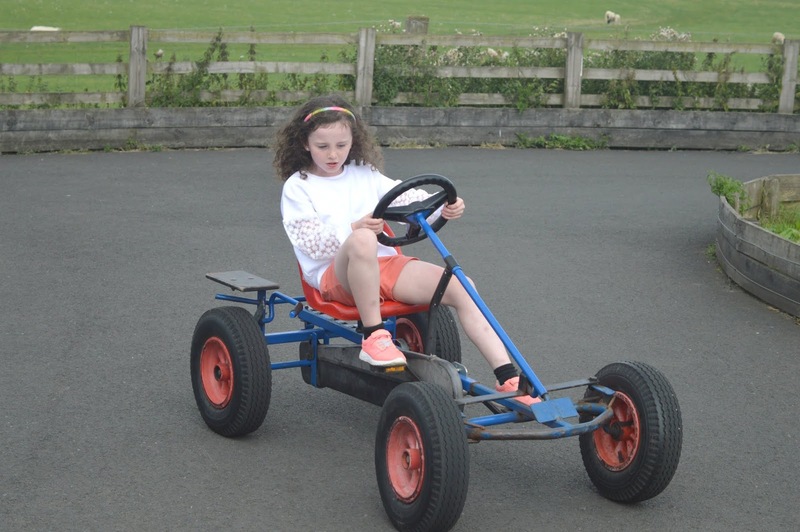 Realising it was close to closing time and there was still plenty we hadn't done we had to choose what we'd do for our final activity of the day and decided some competitive family fun on the Go-Karts would be a perfect way to finish our adventure. 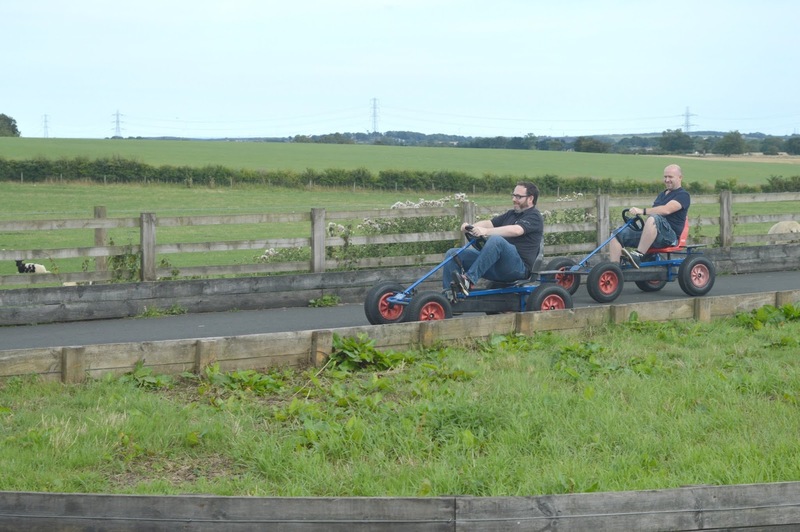 The Go-Kart track is open to everyone to have a go and we loved that the adults could get involved as well and Simon and his brother Mark loved racing each other round the track like big kids and Niall and Sienna were over the moon that everyone was getting involved. 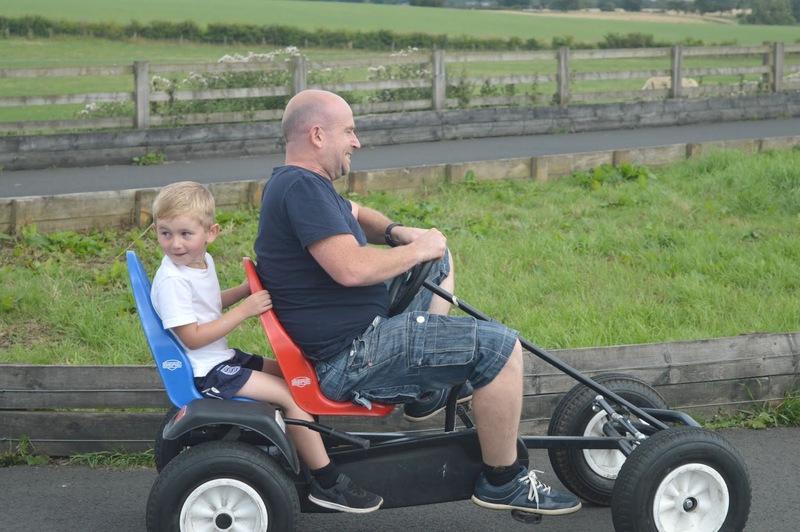 Niall was too little to pedal his own Go-Kart but he definitely had the best deal as he got to be driven round the track by Daddy who looked pretty exhausted manoeuvring the kart round the track whilst Niall sat back and enjoyed the countryside. Such a brilliant end to the day, although I think the adults were a little worried that they may be feeling a little sore in the morning. Whitehouse Farm closed at 5:00 pm and we couldn't believe that our six hour visit had passed so fast and we hadn't managed to get round everything. We had been having so much fun we'd completely lost track of the time and the whole day had just vanished in a blur. As we headed out of the gates to return to the cars my Niece Sienna tapped me on the arm and said some very magic words to me - "Auntie Chloe, this is the best farm I have ever been to!" - I think we all know that kids are the most honest critics so to hear her say that made me so so happy! Something tells me that the children will be talking about how they visited Uncle Simon and Auntie Chloe and got to hold an owl and ride in a tractor for some time to come. Thank you Whitehouse Farm for helping us to become the cool Aunt and Uncle that we've always wanted to be! 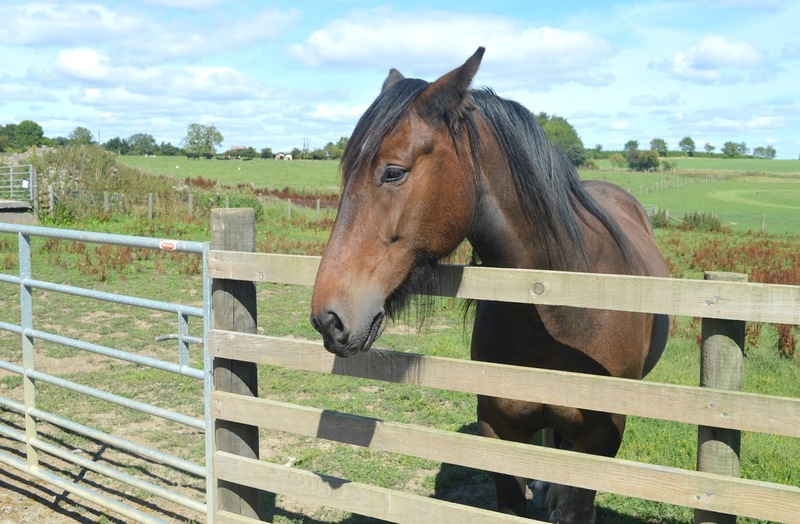 We enjoyed a complimentary day at Whitehouse Farm in exchange for this honest review. From the title of this review you might be thinking to yourself, "what? 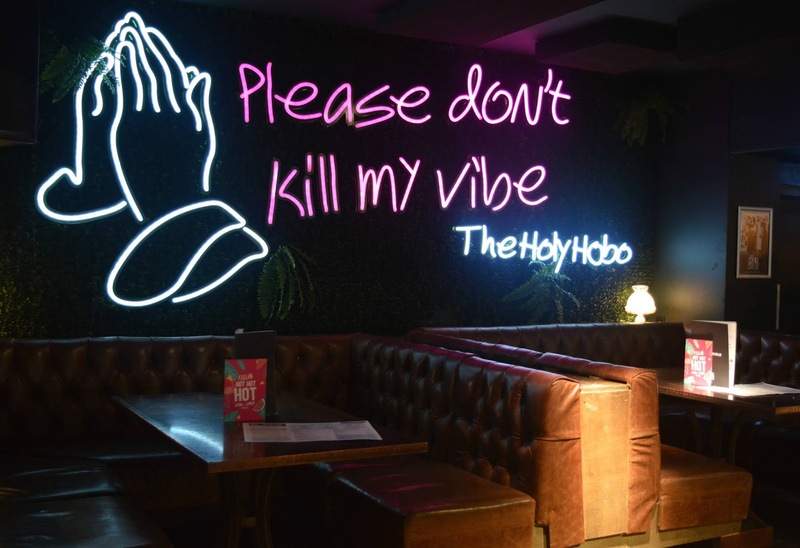 ", and believe me before my first visit to Newcastle's new neighbourhood venue, The Holy Hobo, I was a little confused about what it was about too. A place for daily worship? Cocktail bible? Tank Beer and a Drs Lair? I think we'd best take a look? Many will recognise The Holy Hobo as the former Mr Lynch! Opposite As You Like It, in the heart of Jesmond - home to Newcastle's coolest drinkers, enthusiastic students and the odd 30 something trying to cling on to their youth (that'll be me then!) 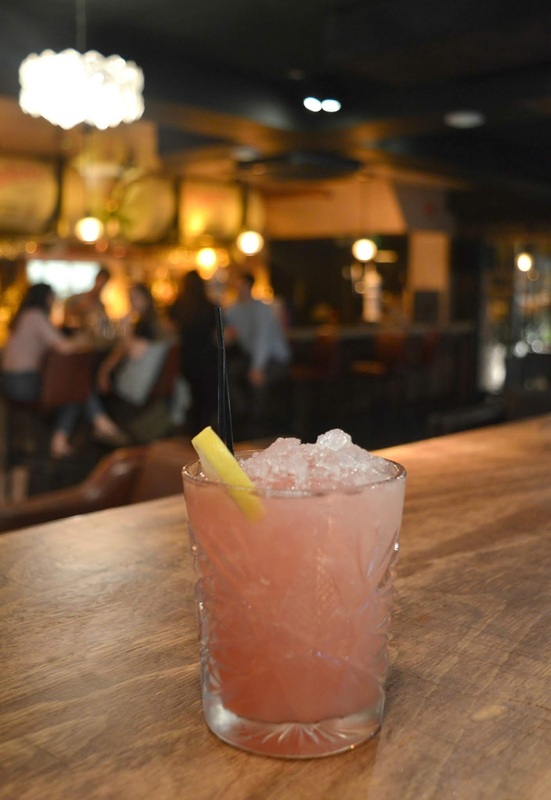 With plenty of bars and a buzzing foodie scene, you'd be forgiven for thinking that Jesmond probably doesn't need yet another bar, however Holy Hobo is trying something a little different. Stepping through the doors with my friend Sarah by my side we didn't know where to look first, The Holy Hobo is a real feast for the eye with the most beautiful interiors. 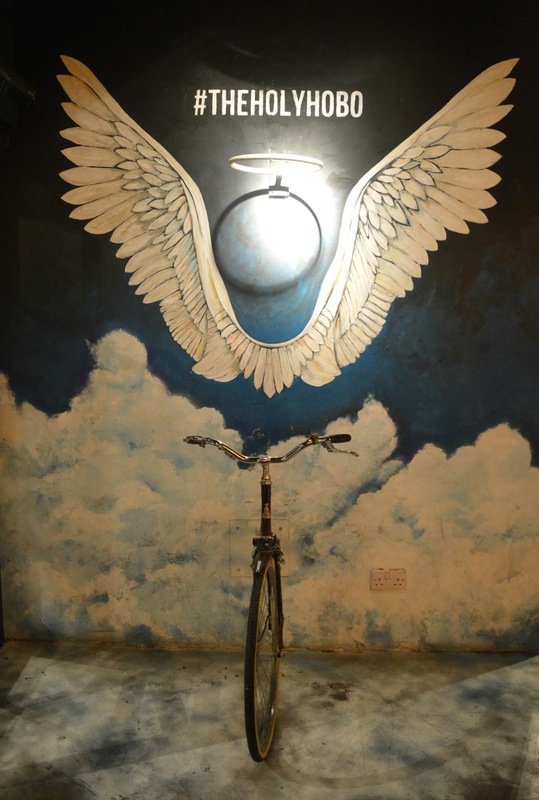 An eye catching neon sign, plenty of foliage and, perhaps the most important part for any Instagram fans, Newcastle's very own angel bicycle. It really is only a matter of time before every single one of us has a snap riding it! The food at Holy Hobo is a double page spread of my favourite types of food - Burgers, Loaded Carbs, Grilled Cheese Sourdough, Salads "for the puritans amongst us" and, a Geordie's favourite, signature Kebabs. Yes, I did say Kebabs! You see, the Holy Hobo is a very special kind of kebab house that serves up create it yourself posh kebabs with slow cooked meats made from scratch and plenty of fresh fillings. 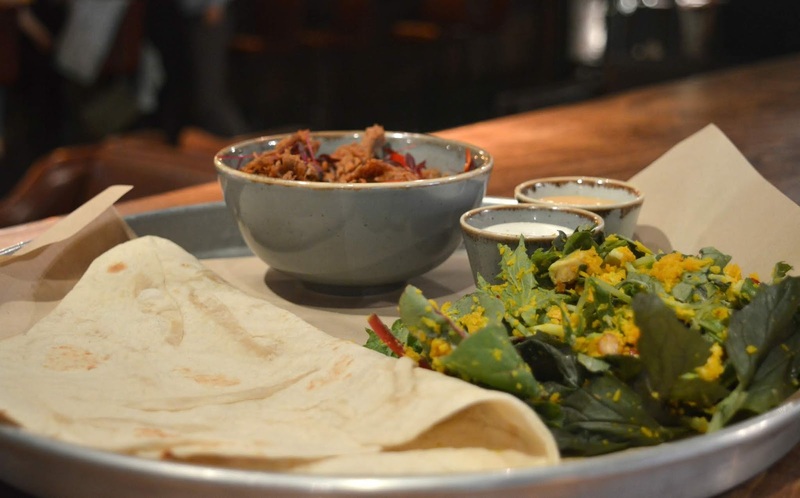 Each kebab comes with your choice of filling, fresh salad and two spice pots as well as naan style bread. The Drinks Bible at The Holy Hobo offers some great craft beers (which I know my husband would love), Posh Shandies, a huge Rum list and some lovely Gin Pairings but for me this trip was all about enjoying some slightly crazy, colourful cocktails. There are pages of classics, Martinis and Mojitos (including the "Redemption of Ant McPartlin" .. cheeky!) but it was definitely the "Tuck Shop" drinks that caught my eye. The perfect drinks for big kids the menu includes a "Dip n Dab" (complete with sherbert Dib Dab and a lolly on the side!) and "Netflix and Chill" (comes served in a retro popcorn box topped with something you wouldn't expect!) and Tuck Shop Shots that taste of sweets! Happy Hour is every day from 5:00 pm to 7:00 pm so, taking advantage, we decided we'd double up (always a sensible decision on a Wednesday evening!) and started our night off with a Twister each (£5.75), served in a short glass the cocktail tasted like a melted ice lolly, absolutely delicious! Personally I would recommend that you visit Holy Hobo with one of your foodie friends because the menu is best enjoyed with a hungry belly and greedy eyes. We decided to order a couple of starters to share (sharing is caring!) 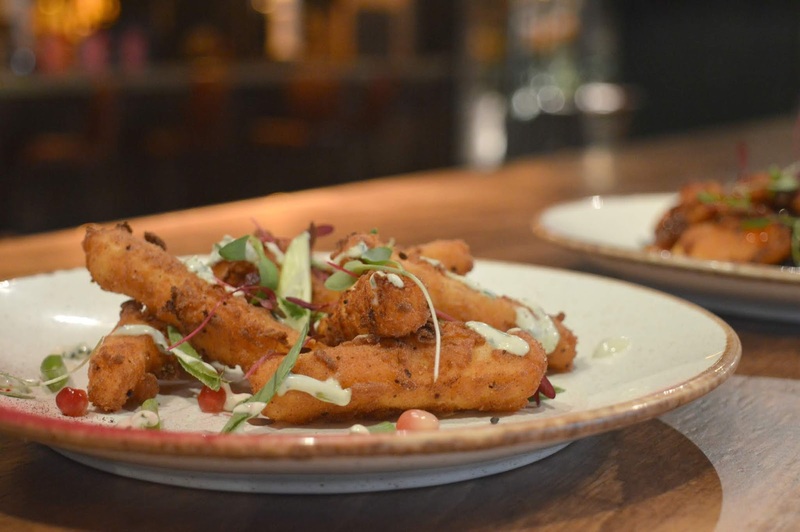 and opted for Halloumi Fries (£6.95) served with fresh pomegranate, lime and coriander sour cream and Popcorn Shrimp (£6.95) served with Asian slaw, lime wedges and sweet chilli dip. The perfect start to our evening the dishes were perfect to share, really delicious and left us excited for our main course. Typical me, when it came to ordering my main course I had to go for the biggest, dirtiest burger on the menu - I just can't help myself. 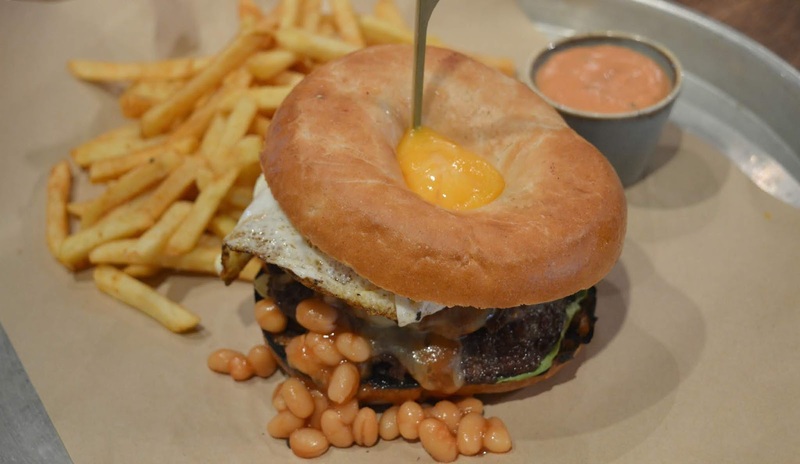 The Holiest of Holy Bagel (£11.50) was pretty much a breakfast in a burger (yes that is baked beans in a burger, don't judge me!) 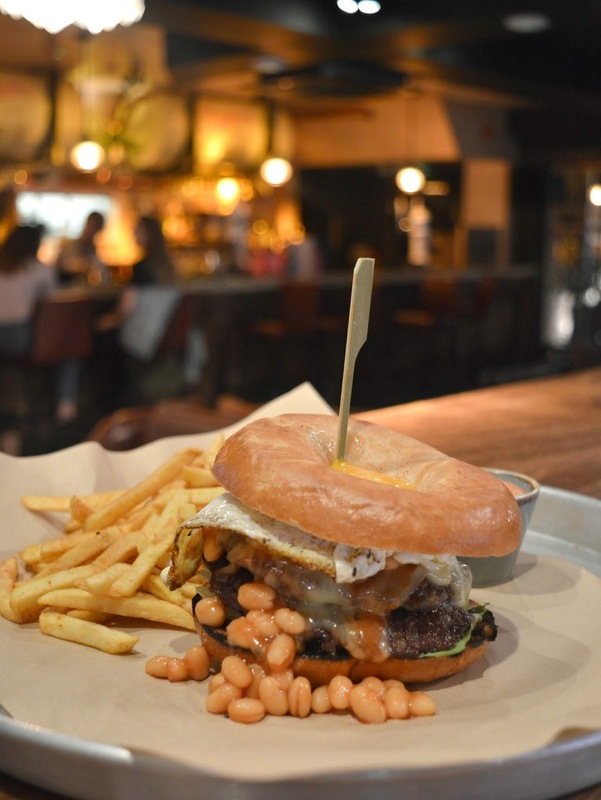 - monterey jack cheese, fried egg, house hash potatoes, baked beans and hobo sauce all stuffed inside a bagel - it was quite a beast! First impressions I loved how the egg fitted so perfectly on top of the burger so that the yolk was peeping out through the hole of the bagel like a beautiful golden halo. Served on what could only be described as a giant tray, it looked absolutely incredible! Unfortunately the kitchen were all out of potatoes so I had fries on the side of my burger so I can't report back on the full experience, however having stuffed this epic burger into my mouth I'd say that the additional potatoes probably make it even harder to eat. Tackling this monster definitely required a knife and fork, there was no way I was going to attempt to pick it up! The fillings were delicious (egg on a burger really is the best!) and I loved how crispy the bacon was. I wasn't too keen on the burger being in a bagel rather than a bun, personally I found it was a little too dry and I'd love to see this beauty in a soft brioche bun instead to really hit the spot. Sarah opted for a kebab which I was very happy about as I was very curious about the DIY element. First she chose her filling - Moroccan 12hr slow cooked shredded lamb (£11.95) and then her salad and finally she added two sauces. Neither of us could finish our food, that's how huge the portions were. I hardly ever leave anything on my plate but Holy Hobo well and truly defeated me and, can you believe it, I couldn't even manage dessert! I'm a little gutted as dessert is my favourite course and as there isn't a sweet menu online I can't even tell you what they serve, I'm very curious to find out! Before we left there was just one more place that we had to explore - The Dr's Lair, the very secret home of Dr Sinclair that you will find hidden at The Holy Hobo, but only if you know where to look! Accessed through a vintage photo booth using a secret password, the lair is a secret bunker of red velvet curtains, flickering lights and offers a different cocktail menu to the main bar in Holy Hobo all served in very curious looking test tubes, bottles and vials. It's open over the weekend so make sure you discover the secret when you pop by for a visit! 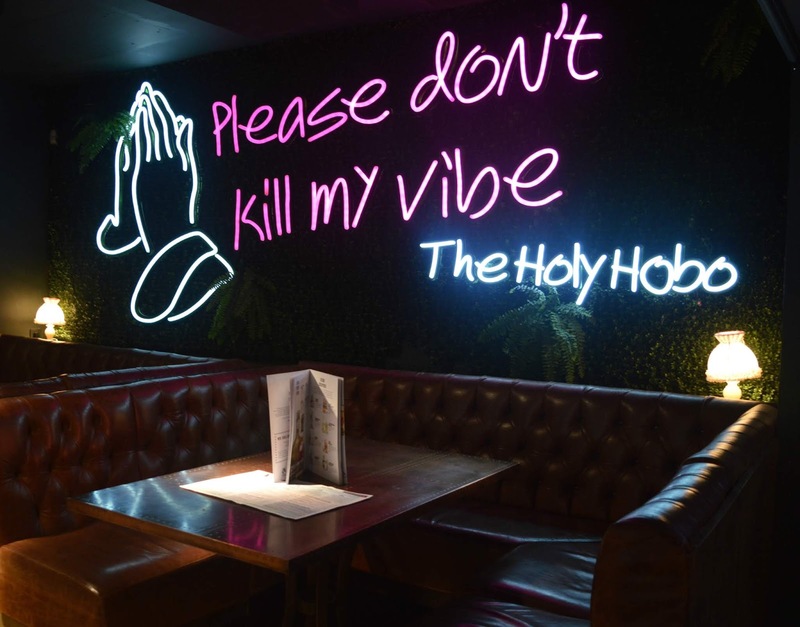 We were invited for complimentary food and drinks at The Holy Hobo in exchange for an honest review. 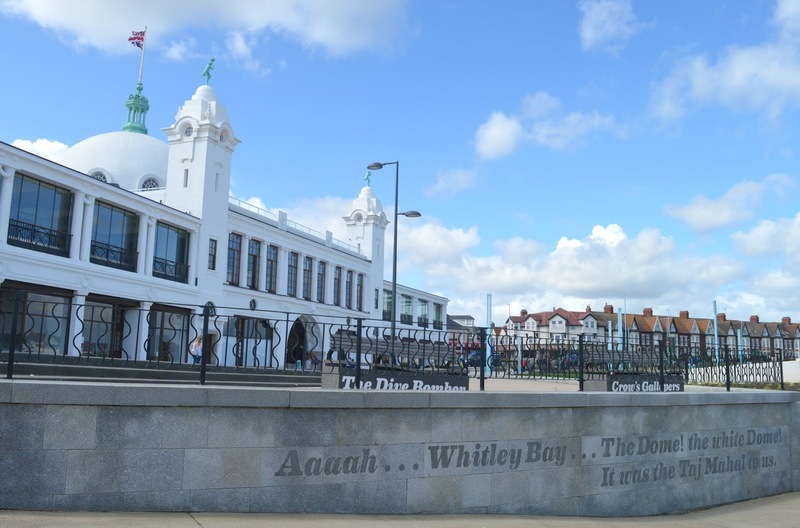 "I like Whitley Bay as much as the next man but I don't think I'd call it the "ultimate seaside destination"
.... which prompted me to write this blog post! 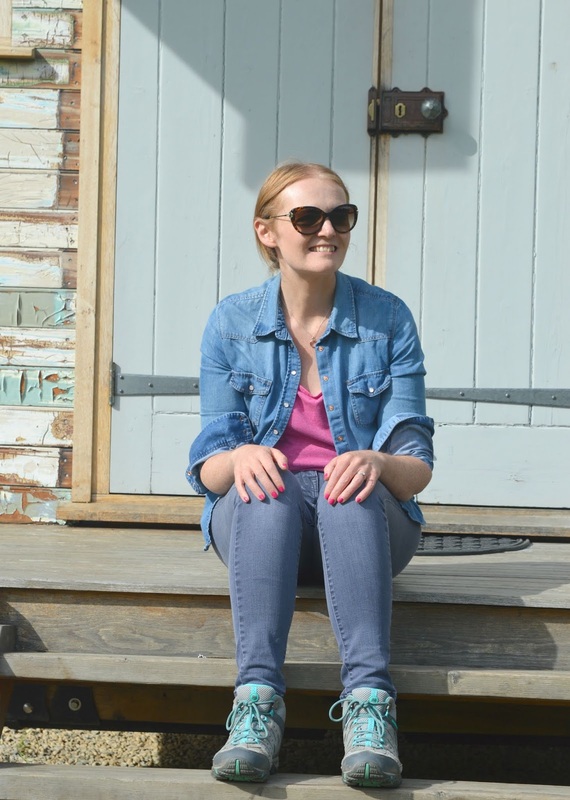 I have so much love for Whitely Bay and it really has become my special place, it's where we head when we have visitors, the place we go when we need some fresh air, our "go to" for delicious food and, most recently, was the only place I wanted to be after the death of my Grandma. Whitley Bay is good for my head, heart and soul and today I just had to share some of the reasons why I love it so much. I think we all knew this was coming! Everyone knows how obsessed I am with the ice-cream at Di Meos, I honestly have to stop myself driving to Whitley Bay every night of the week for a cone. The flavours are so rich, the mixture is so creamy and I think it's safe to say that we have now tried every single flavour on the counter. 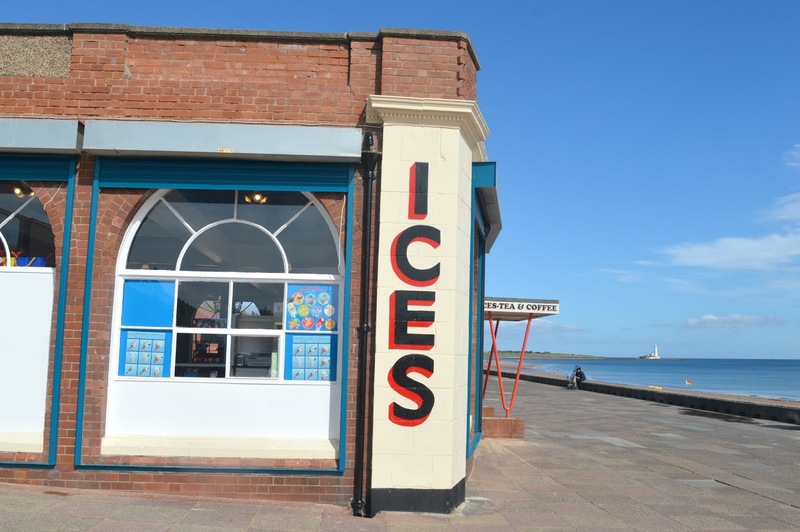 There are many fantastic ice-cream parlours in the North East, but Di Meos in Whitley Bay will always have our heart. I love the history around the Rendezvous Cafe on Whitley Bay's Promenade, I love to imagine that couples who first began their courting over ice-cream sundaes in the 1930s now take their children and grandkids to the parlour to tuck into the classic desserts that they enjoyed many years before. It is such a stunning and iconic building and walking through the doors is a lovely little glimpse at Whitley Bay's past. St Mary's Lighthouse was one of the first dates Simon and I ever went on so it'll always be somewhere very special to us. I may be biased, but I believe climbing St Mary's Lighthouse in Whitley Bay is something that everyone should do. The views are just spectacular! To me the lighthouse is iconic, it can be seen for miles, features in just about every seaside photograph that I take and makes Whitley Bay just that little bit more beautiful. Whenever the UK has a heatwave I have a little chuckle to myself when I see the photos in the paper of Brighton beach packed out with sun worshippers covering every last inch of the sand. Here in North Tyneside our beaches are award winning yet you will always find a space to park your bum even on a hot and sunny day. We have miles and miles of beautiful beaches and the sands at Whitley Bay are pretty empty compared to other British seaside resorts. Restored and ready to be loved by a new generation of Whitley Bay residents, Spanish City once again stands proud over the seafront and has made the seaside town look glorious once again. The Taj Mahal of Whitley Bay offers the most beautiful views of the coastline (with a glass of prosecco in your hand of course!) and has brought loads of new restaurants to the seafront. The foodie scene in Whitley Bay is out of this world and if you haven't tried any of the local spots yet you are truly missing out. There are so many independent restaurants, cafes and coffee shops to try all offering the most fantastic dishes and run by hardworking, extremely talented local people. If I lived in Whitley Bay I'm convinced I'd eat out for breakfast, lunch and dinner every day! I used to love playing in rock pools when I was a youngster and whenever I visit Whitley Bay it makes me smile to see families carefully balancing on the rocks with buckets full of creatures. 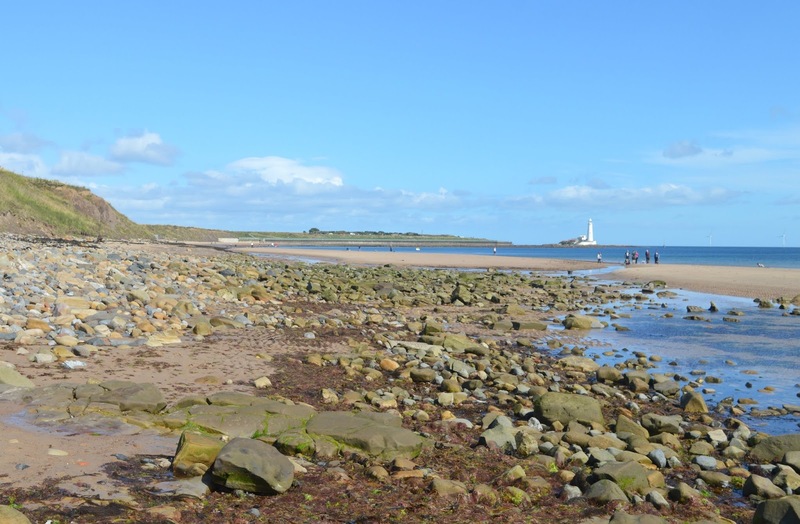 The Bay is a prime spot for rock pooling with plenty to explore and discover and, if you're very lucky, you'll even get to see seals on the rocks by St Mary's Lighthouse. Those are just some of the reasons why I think Whitley Bay is the ultimate seaside destination but I'd love to hear some of your ideas, or if you think somewhere else deserves the crown! 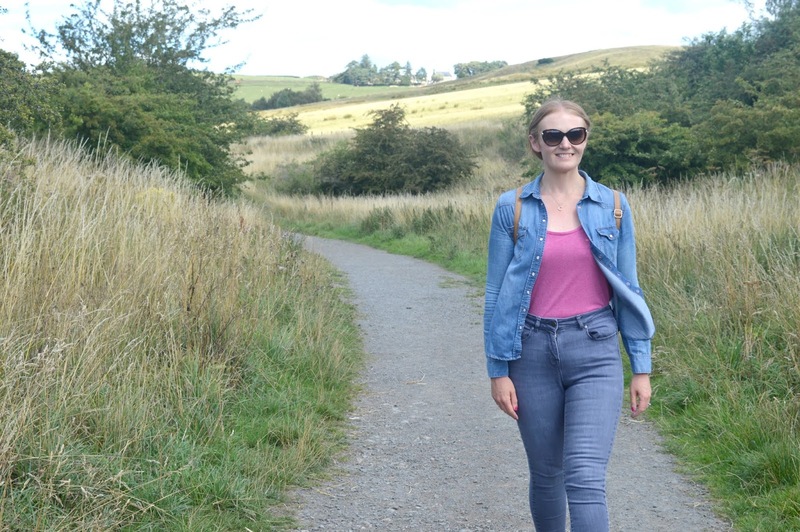 Whilst we've done a lot of walking along the Northumberland Coast this Summer we haven't really spent much time in the countryside so last weekend we decided to visit Hareshaw Linn for a beautiful waterfall walk in the Northumberland National Park. We're the first to admit that we prefer our walks simple (who wants to ruin their hike with an argument over maps and directions?!) and the walk to the waterfall at Hareshaw Linn has to be one of the easiest in the Northumberland National Park. Zero navigation skills required it's a simple "follow the path route" that takes you directly to where you need to go. We parked at the designated car park in the little town of Bellingham (closest postcode for your satnav is NE48 2DA) in the heart of Northumberland. Be warned the car park is pretty small and we were very lucky to bag the last spot on a particularly hot and sunny Friday afternoon. The start of the walk is clearly signposted from the carpark and once we were on the path we didn't need to worry about where we were going. The first part of our walk was pretty open, not ideal with the hot sun beating down on top of our heads. Being a little unprepared neither of us were wearing sunblock which meant an uncomfortable start to our treck with neither of us being able to take off our sleeves for fear of sunburn (a mistake we won't be making again in a hurry!) 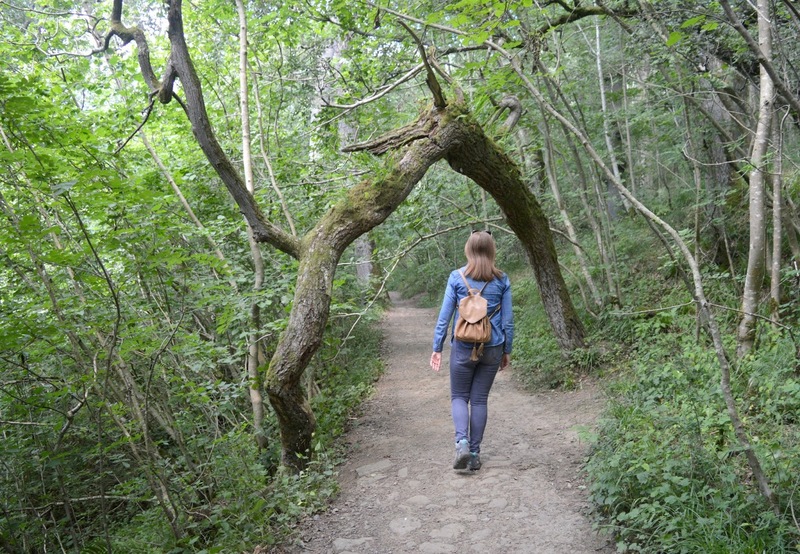 Luckily, just as we began to get a little too hot we started our climb into the ancient woodland of Hareshaw Linn and the delicious shade of the trees. I've heard many people say the woodlands at Hareshaw Linn are magical and in all honesty there's no better way to describe them. If fairies and elves do exist I truly believe that is where they are living because the woodland was absolutely stunning, very peaceful and just had a very calming feel about it. I immediately felt relaxed as soon as we started strolling underneath the trees and did catch myself keeping half an eye open for wandering pixies as well as the usual wildlife we love to spot in the Northumberland countryside. 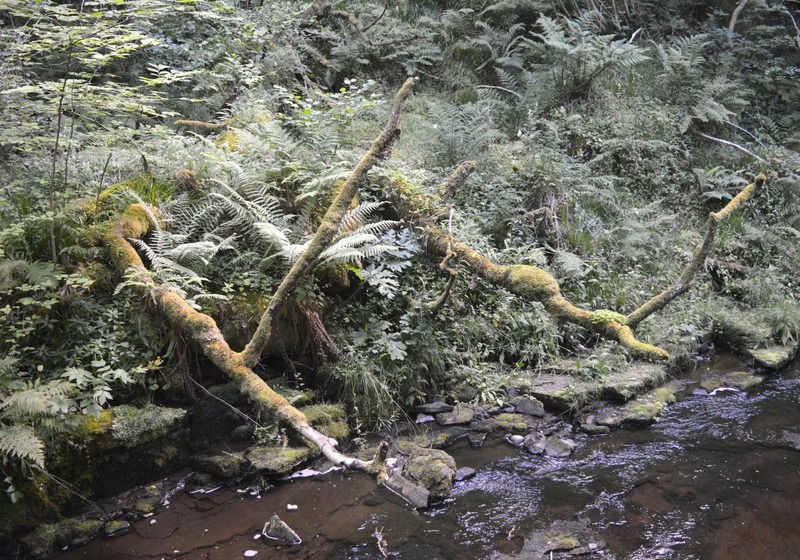 There are over 300 different types of moss to be found at Hareshaw Linn, a fact that you might not find too interesting until you're in the woodland for yourself and can truly appreciate the beauty of the surrounding foliage. The damp edges of the water attracts the most wonderful spongy moss in different shades of green and they really add to the remarkable atmosphere of the ancient woodland. The hike through the woodland wasn't the easiest walk we've ever been on, not helped by the heat (and perhaps the amount of food we've been over indulging on recently!) we puffed and panted our way up and down steep steps, struggled our way up a few hills and carefully negotiated some sudden dips to make our way towards the waterfall. Although only 3 miles long, this definitely isn't a walk for the unfit and sensible footwear is strongly advised. When we finally reached the treasure at the end though it was worth the hard work. Our first glimpse of the waterfall arrived just as we were met by the most beautiful rocky cliff edge. 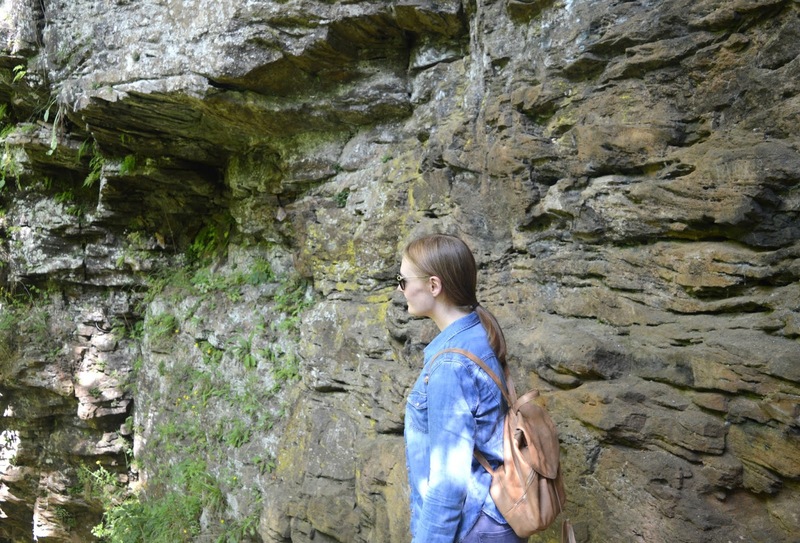 I've honestly never seen anything so beautiful in my life - a whole wall of rock towering above us deep in the heart of the woodland. It truly was magical. A short climb down some steps and we were finally looking over the beautiful waterfall of Hareshaw Linn. Significantly quieter and more picturesque than our trip to the famous falls at High Force, we wondered why less people seem to know about these waterfalls because they surely must be the most beautiful in Northumberland. We were stood there with only a very small handful of others enjoying the peaceful rushing of the water and marvelling at the beautiful reflections on the rocks at the bottom of the fall. Being very careful to navigate the rocks we managed to hoist ourselves down to the water below for a proper look and felt truly lucky to be one of the few people enjoying the scenery on that afternoon. It may not be as easy a walk as the short stroll to High Force but the views did make it feel that much better. Unfortunately, the one negative about the walk to the waterfall at Hareshaw Linn is that you have to walk back the way you have just come! I don't know about you but I much prefer a circular route to get some different scenery! Of course, I can't just leave you there, every great walk has to come with a food recommendation - I mean if you're going to get involved in a hike you need the promise of tea and cake to pull you through, am I right? 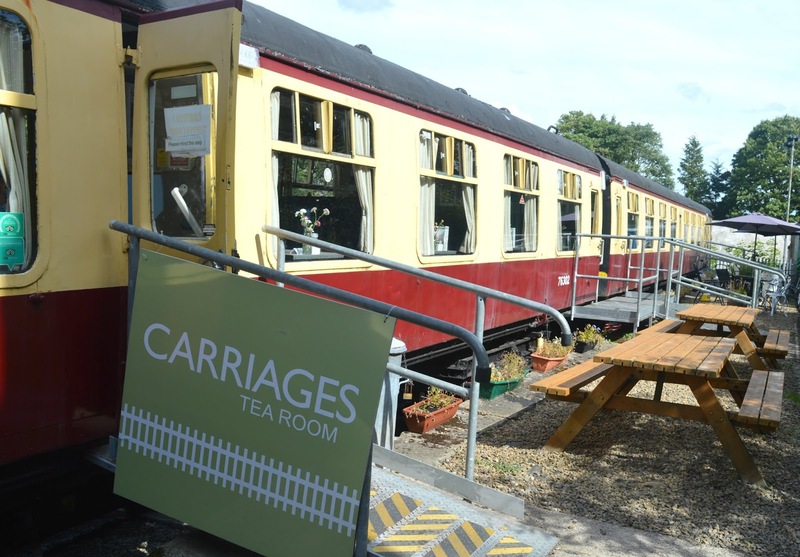 A short stroll from the carpark you'll find the quirky and delicious Carriages at Bellingham, an old train carriage that's been turned into a tea room serving up fantastic homemade cakes. Sometimes places like this can be a little gimmicky with less than average food but we both agreed that our cream teas were spot on with fantastic scones and a generous helping of cream and jam to pile on top of them. 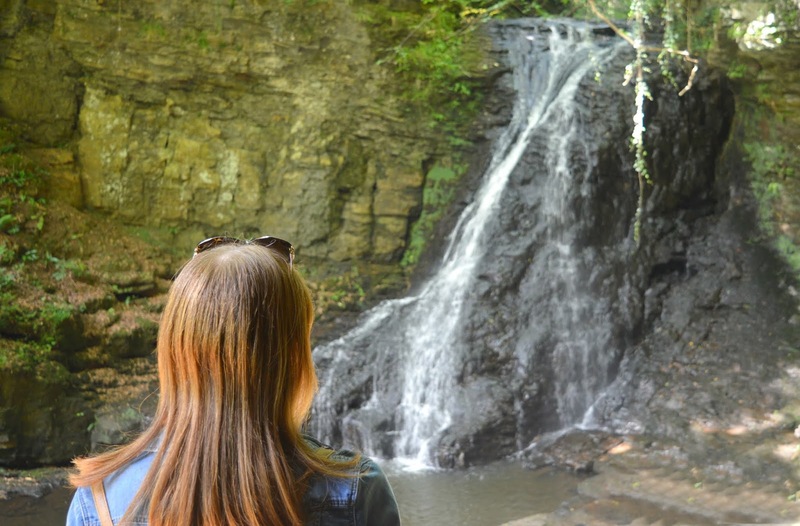 We loved discovering the waterfall walk at Hareshaw Linn and it's made us realise that we still have plenty more of the Northumberland National Park to discover. 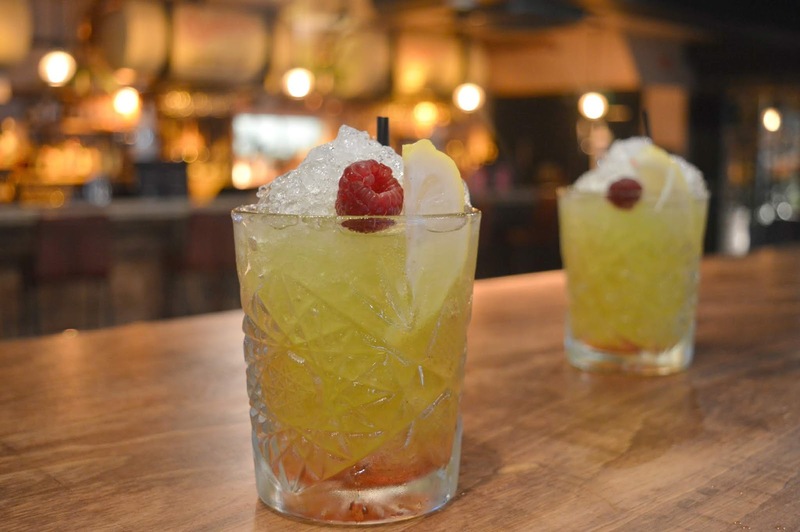 Make sure you let us know your favourite spots so we know where to try next time! After our last glamping experience in Northumberland my husband declared that glamping wasn't for him and that he wouldn't be in a rush to do it again, leaving me a little heartbroken as I absolutely loved it. 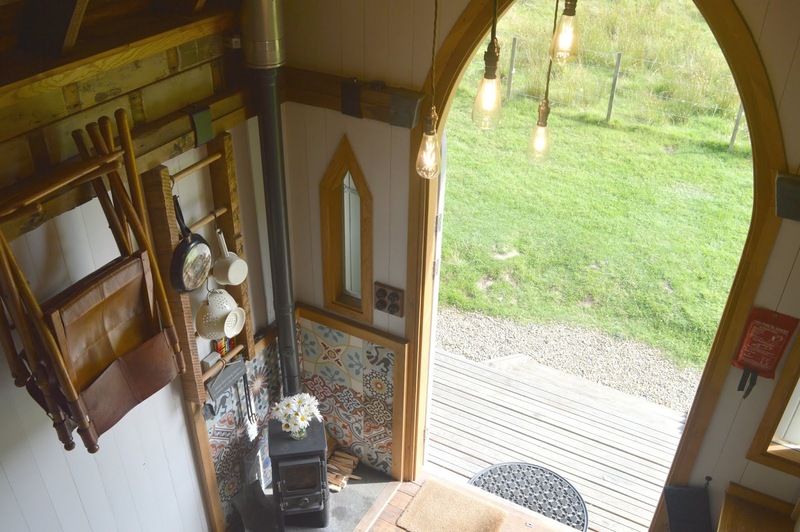 So when Hesleyside Huts got in touch to invite us for an overnight stay at their luxury glamping site in rural Northumberland I didn't know how on earth I would convince him to give it another go. I kept my fingers crossed as I showed him their beautiful website - pointing out the comfortable looking beds, cosy huts and telling him how it would be the ultimate luxury camping experience. I was over the moon when he agreed and quickly arranged a date before he could change his mind! No pressure Hesleyside Huts but I really really needed something very special to get my reluctant glamping husband back on side. I had promised him an idyllic luxury glamping experience and I pinky promised that if he didn't enjoy himself I would never make him glamp ever again. Hesleyside Huts have everything you could possibly need to convince the most unadventurous person in your life to give glamping a go. 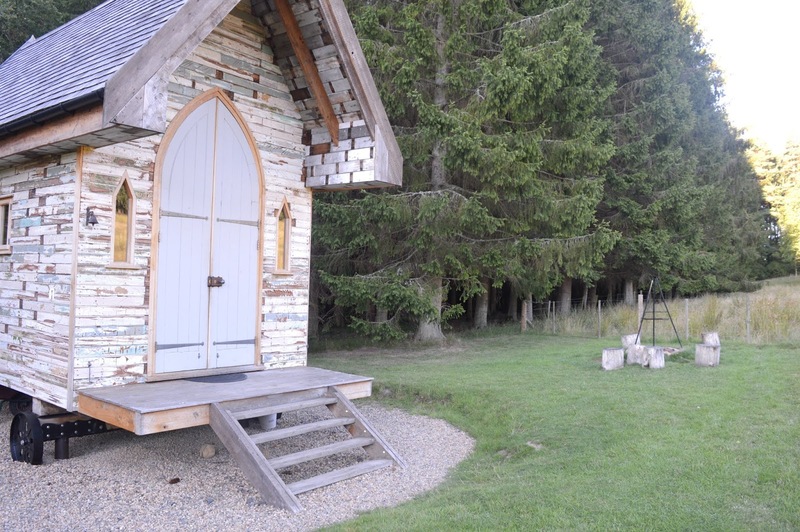 Each Hut promises comfortable luxury with plenty of home comforts including fully functional kitchen spaces, luxury bedding and even electricity! 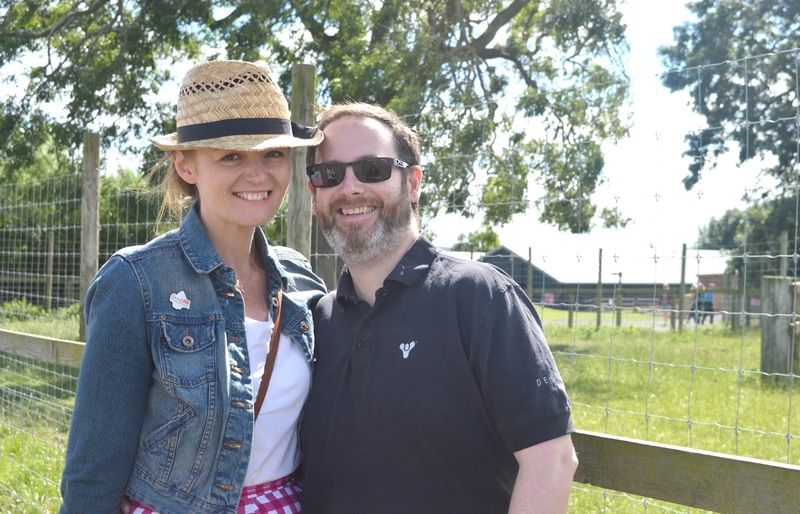 It was time for a very enthusiastic glamper and her rather reluctant (slightly grumpy) husband to put it to the test! You'll find Hesleyside Huts in the beautiful Northumberland National Park, just outside of Bellingham, and a few miles from Kielder. Set in acres of private woodland with river walks and meadows to explore, it's the ideal escape from modern day life with enough on the doorstep to keep every type of adventurer fully entertained. After weeks of planning (and by that I mean googling s'mores recipes!) we arrived at Hesleyside Huts for check in at 4:00 pm with minimal effort using the extensive guide that we had been sent with our booking confirmation. As a self confessed control freak I loved having so much information in advance and the directions, arrival details, maps and contact lists were much appreciated. No one wants to worry about things when they're planning a night to switch off. 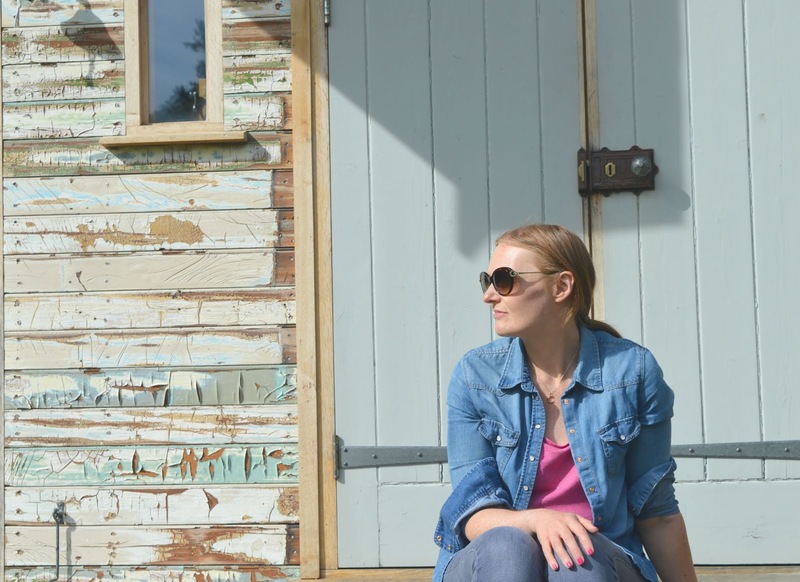 Hesleyside Huts have five gorgeous huts to choose from, each different in style and a good distance away from each other to ensure a peaceful break. From romantic breaks for two to big family trips there's a hut to suit every need and having a quick nose through the trees at the other huts they all looked beautiful. Each of the huts has its own designated parking set out clearly on a map and we loved that our space was marked so we knew exactly where to leave our car. 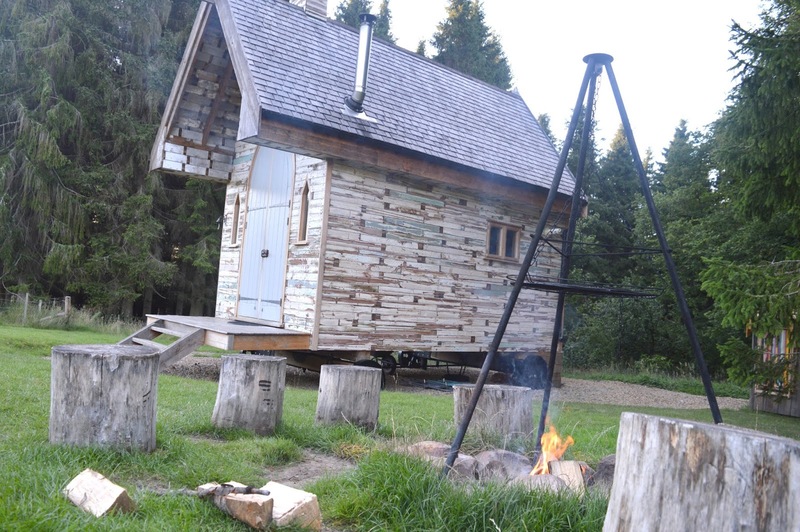 Each space comes with a wheelbarrow (for transporting your luggage to your hut) and a little box with a torch in case you arrive after dark. 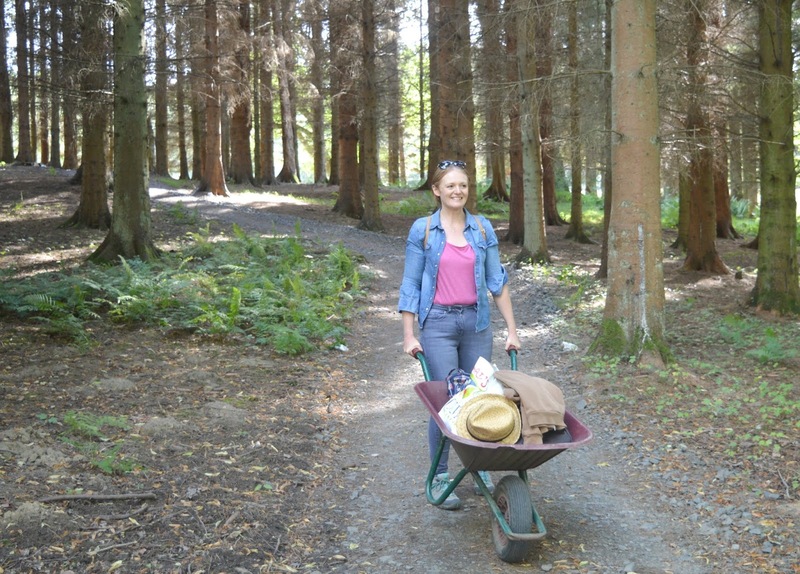 We loaded the contents of our boot into the wheelbarrow (after I'd failed to convince Simon to push me up to the hut in it!) and set off through the most beautiful little pine forest in search of our hut. 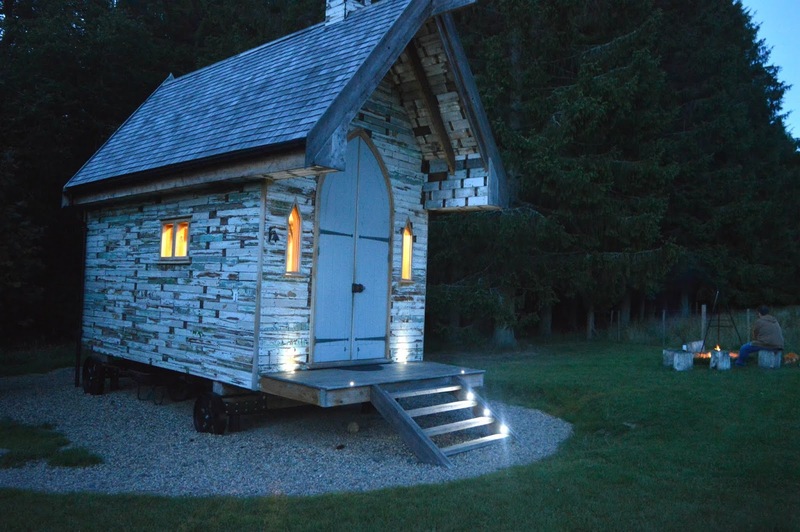 Our home for the night was Holly Hut, the cutest little hotel on wheels, perfect for a romantic break for two. 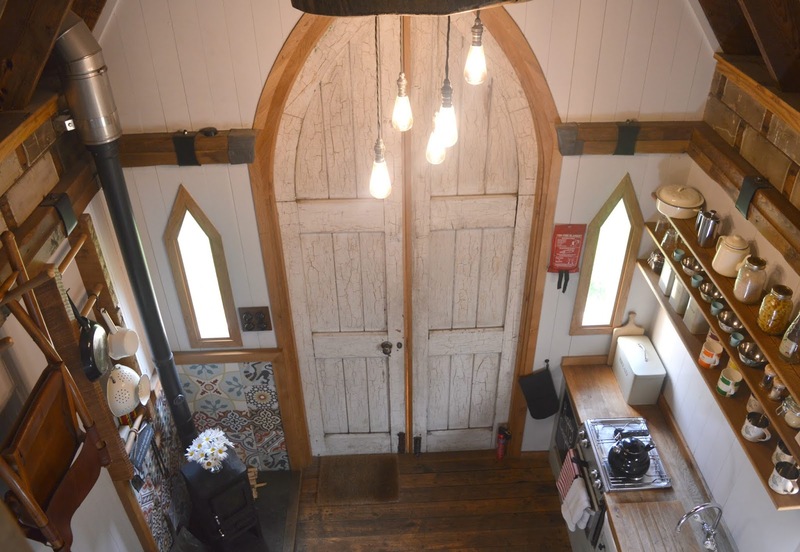 Inspired by New England pioneer chapels and made entirely from reclaimed timber, she's clad in reclaimed wood salvaged from an old Victorian school and has original church doors. 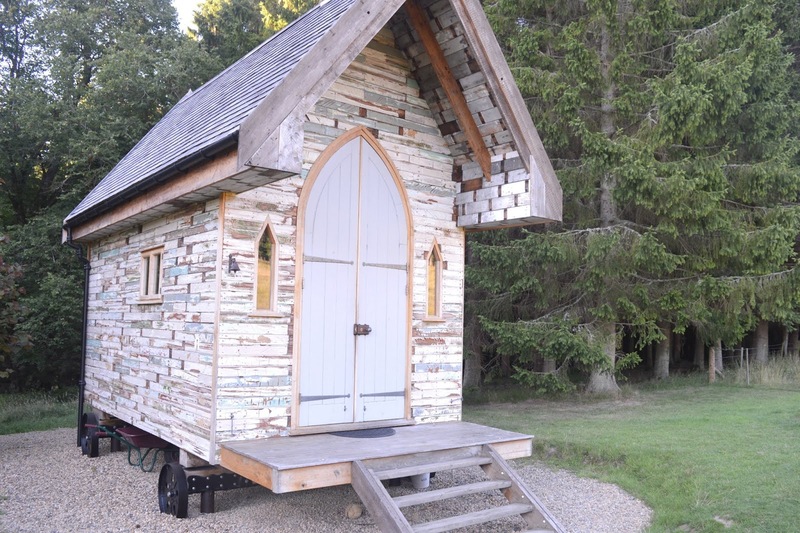 A double height hut on wheels, she's the ideal hut for a cosy staycation for couples and when we saw her for the first time I honestly felt like pinching myself. I think you'll agree she's quite the beauty! 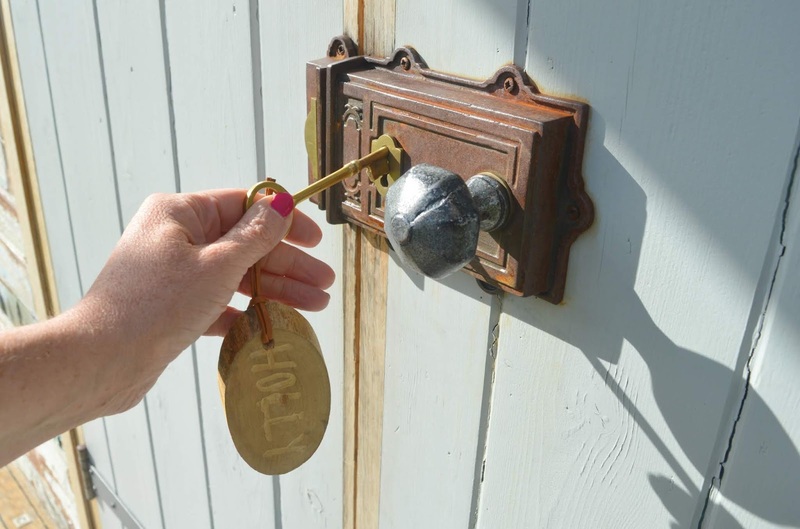 Holly Hut was ready for us with the key left in the lock, although you can arrange to meet the owners for a little tour of your new home, we preferred to discover Holly for the first time on our own - it certainly made our adventure more romantic. It took us a while to finally throw open the doors, I was too busy running around the outside just taking in how beautiful our hut looked. It almost seemed a shame to turn the key and take a look inside because she was just looked so perfect with her doors closed. 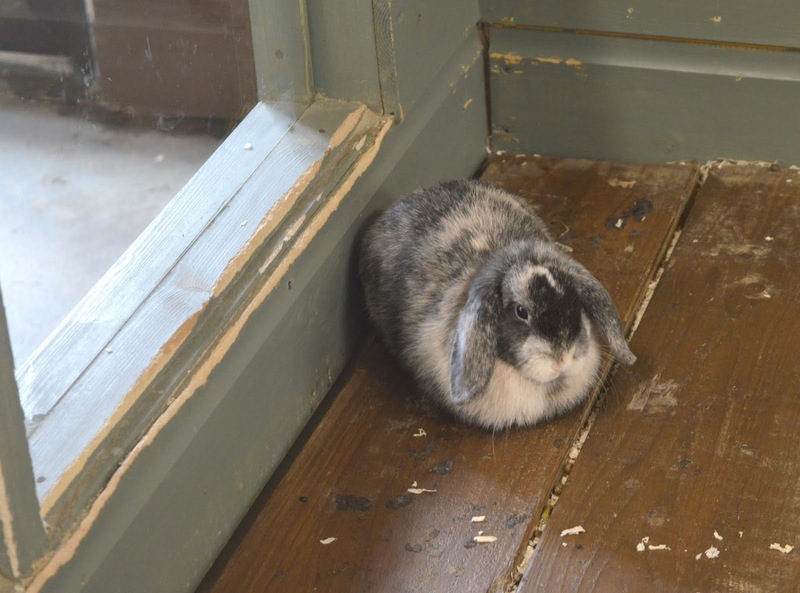 When we did finally open the doors to Holly I couldn't believe what we discovered inside. Her interior was far bigger than I imagined and was even more adorable than I could have hoped for. I'd seen the photographs on the website, but seeing it all for myself in person was just magical. Walking through the doors we were greeted by a gorgeous living space for two complete with a kitchenette (boasting a small fridge, stove and sink!) chairs, and a tables for indoor dining, our very own flushing loo (how posh!) 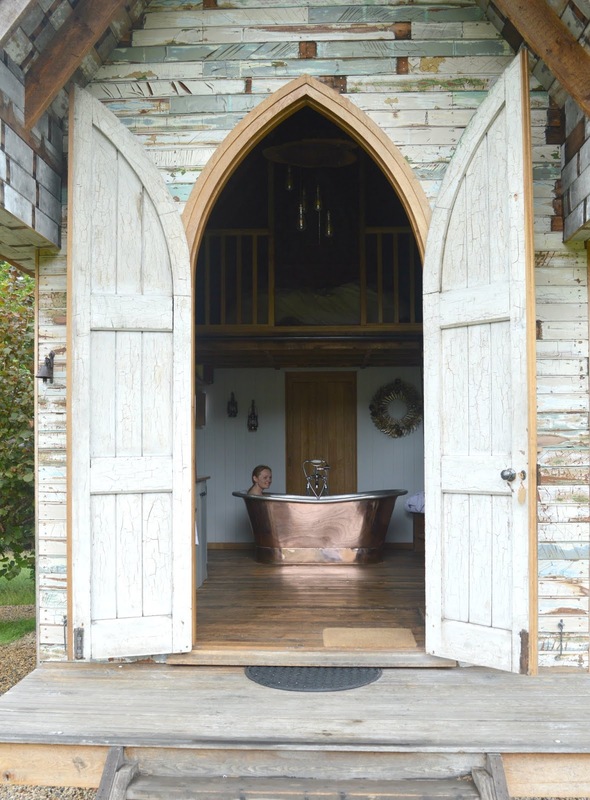 and, the absolute highlight, the most perfect double ended copper bath tub with hot water. It was incredible how everything was packed so neatly into the hut to utilise the space. The chairs were hanging on the wall and the huge shelves above the sink were packed with all kinds of treasures including books, a radio and a jar of marshmallows. Tea, coffee and sugar were all provided as well as washing up liquid, loo roll, hand soap, tea towels and, my husbands personal favourite, a generous amount of sweets that he spent our entire stay chewing on every time he thought I wasn't looking! We had a full list of what we would find in Holly with our booking confirmation which had made packing simple, we knew exactly what we needed to bring and what was already there waiting for us. Our bedroom for the night was on the mezzanine level which was accessed by a very sturdy wooden ladder on wheels that pulled to the centre of the hut for access up and could then be stashed away to the side if we wanted to use the space downstairs. I have to admit I'm not the most confident of ladder climbers (you'd never catch me going up in to our loft!) 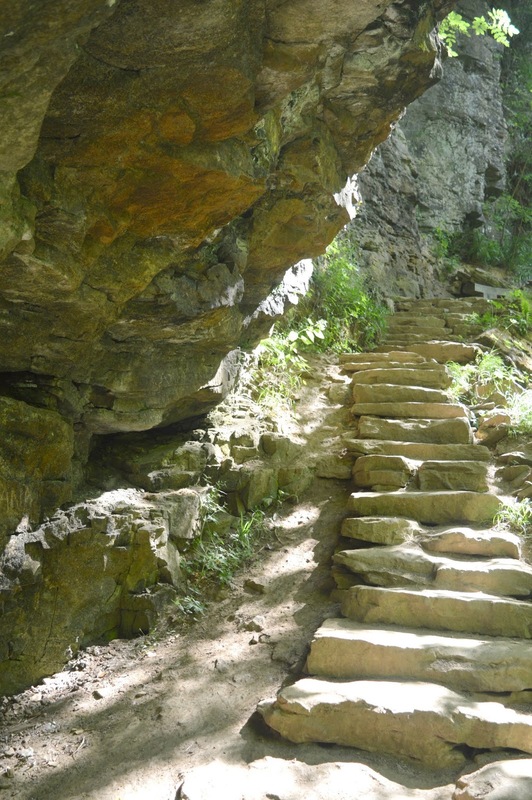 but Holly's ladder was very sturdy and more like stairs, slightly slanted with nice wide steps. Going up to the top floor was quite an adventure and by the end of our trip I could race up and down easily transporting things to and from the bedroom. 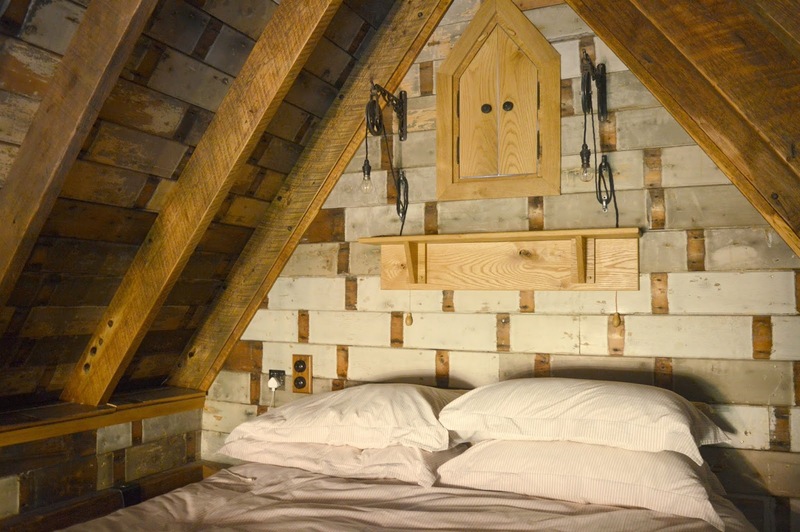 The top level of our hut was very cosy and boasted a King Size bed with luxury mattress, Egyptian cotton bedding and even hot water bottles. Being tucked away underneath the wooden beams of the hut was very beautiful. We had everything we needed including plug sockets by the bed (yes really!) and light switches to control the lights in the hut as well as some very pretty ambient lighting round the bed. We were so impressed by all of the little details that had been taken care of in Holly to make our glamping experience truly luxurious. 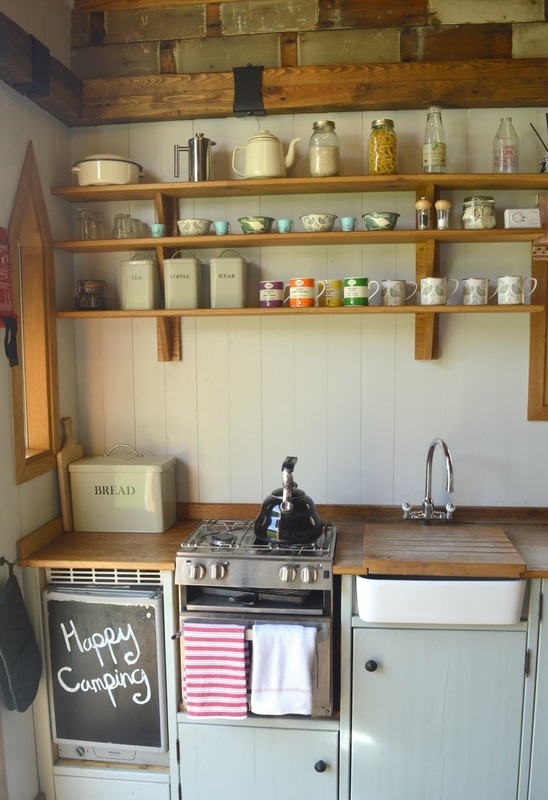 We couldn't believe how much we discovered in our little hut - we had everything from plates, bowels and cutlery, wine glasses and pans to towels, bedding, fluffy towels and even electricity points! After thoroughly inspecting our hut I had a little glance over at Simon and caught a little smile, I think Holly was winning him over! Of course, no one wants to be completely cut off from the outside world and it just so happens that Hesleyside Huts are perfectly located around 9 miles from one of our favourite places in the North East, Kielder. Miles of walks, the most stunning countryside and one of the best places in the country to spot red squirrels (read all about our last visit to Kielder here). 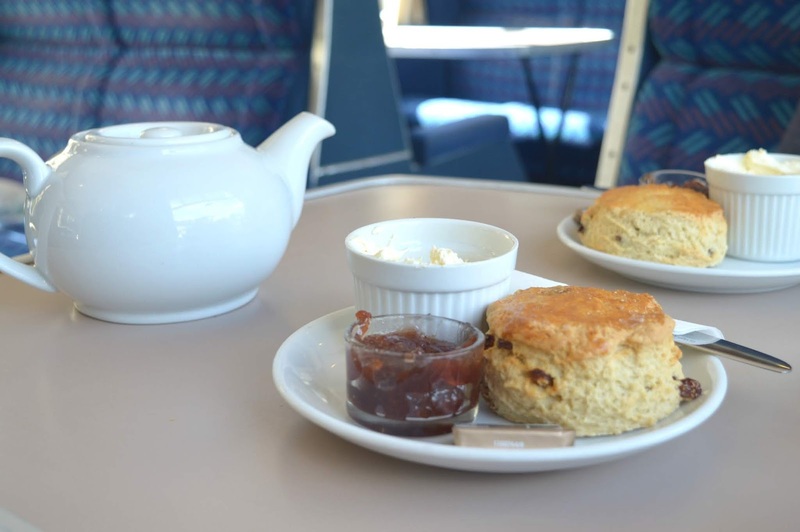 As it hadn't been very long since our last visit to Kielder we decided instead to head to nearby Bellingham for a beautiful waterfall walk at Hareshaw Linn followed by a cream tea at Carriages Tea Room, both recommendations we had discovered from our welcome pack at Hesleyside Huts. I'd love to tell you that we spent our evening cooking up a slap up meal on our little gas hob but I have to confess that we actually ended up in a pub up the road. I know, it's such a cop out, but as my marriage is all about compromise I promised Simon a few hours in the local before a full evening in the wilderness. Hesleyside Huts gave us a full list of recommended places to eat and we decided to pick one off the list and booked a table at The Pheasant in Stannersburn, a 10 minute drive up the road. The cosy pub served up delicious homemade dishes and we both tucked into Chicken Pies with loads of veg and then shared a dessert because it would have been rude not to! I think we wolfed our food down in record time because we were both so keen to get back to Holly Hut! I doubt there's many people who could claim that their relationship isn't somewhat ruined by the constant need to be on their mobile scrolling through social media. 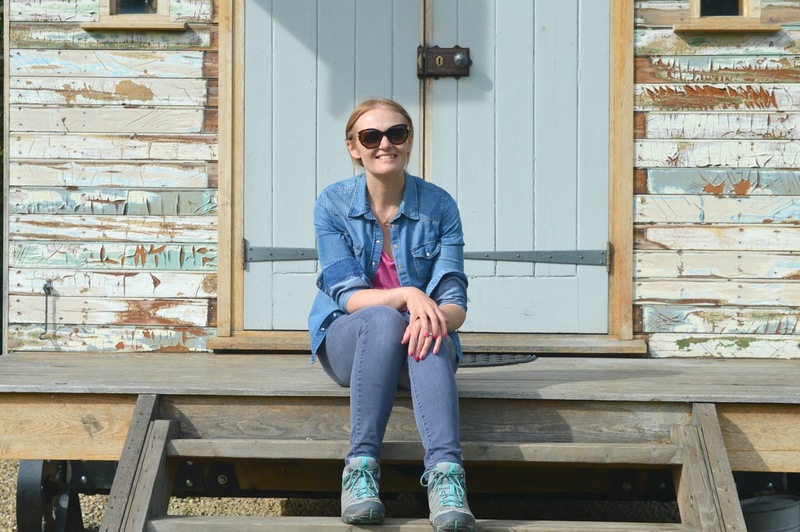 Our night at Hesleyside Huts allowed us the luxury of being able to return to the early days of our relationship where we would sit and talk for hours, sharing stories and giggling like teenagers. 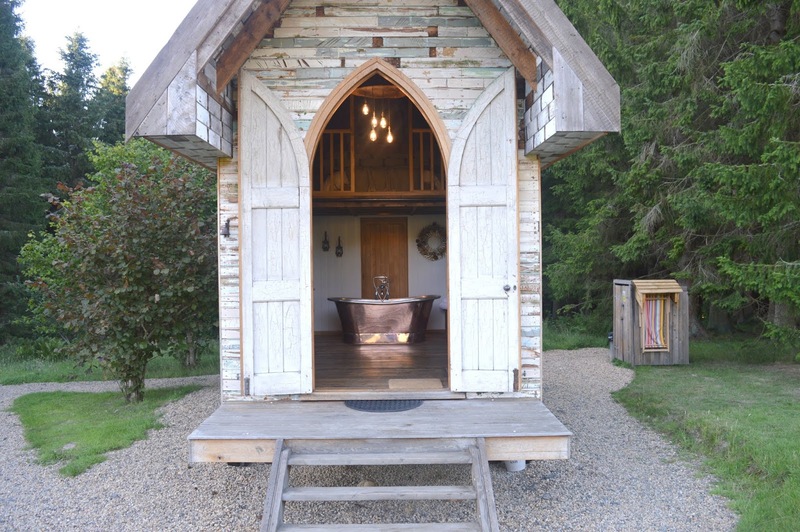 It possibly sounds a bit silly, but Holly made me fall in love with my husband all over again and if you're wanting an idyllic night of romance I can't recommend Holly Hut enough! With no TV and limited mobile phone signal, we had a rare opportunity to just enjoy each others company without distraction. So how did we spend our evening? By the camp fire of course! We had been very lucky with the weather and a gorgeous sunny day had lead to a wonderful warm evening which allowed us to spend our entire night outdoors enjoying the beautiful evening. Holly Hut has her very own fire pit and we gathered up our complimentary wood, fire starters and matches and had the fire going in no time. Being fully committed to keeping the fire alive Simon spent his entire night nursing the flames like they were our first born child, carefully feeding the fire with wood and giving me very srtrict instructions not to let it die every time he left it for a few moments. We soon realised that we would need more wood so left £5.00 in the honesty box and helped ourselves to another bag. Although there were comfortable looking deckchairs we could use we happily sat ourselves down on the wooden stumps by the fire with a couple of cheeky ciders that had been cooling in the fridge. Toasting to our great success (you honestly wouldn't believe how smug we felt about getting that fire going!) 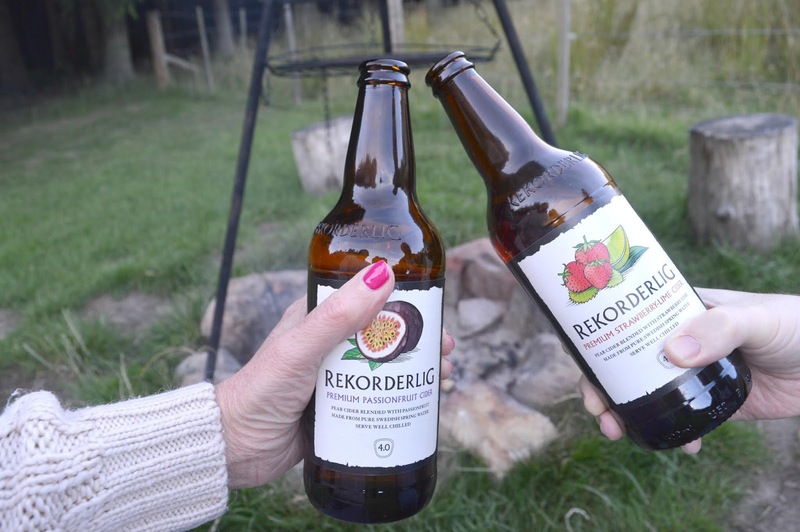 we sipped on our sweet ciders whilst watching the bright orange flames lick the wood - you don't get much more relaxing than this! 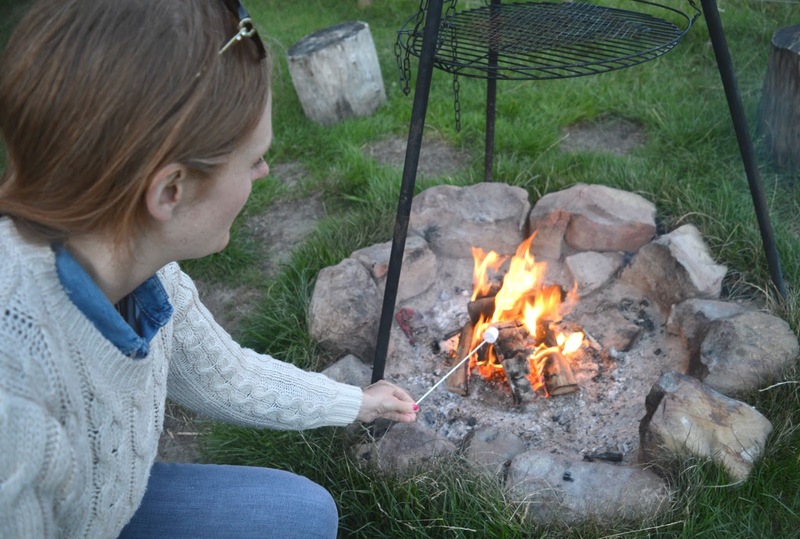 Of course you can't have a camp fire without marshmallows and, although we knew we'd have some in the hut, we had brought our own pack along too just to make sure that we had enough along with a packet of chocolate biscuits which I hoped would be the perfect ingredients for s'mores. 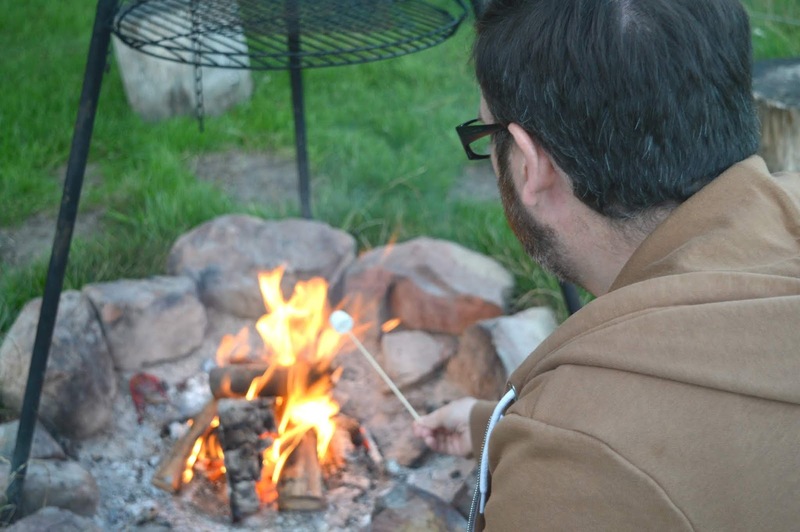 Once we'd got it just right we decided to crack on with Holly Huts very special mammoth marshmallows that we knew would be perfect for s'mores. They were so huge we decided to toast them with two sticks to ensure their safety in the fire and carefully toasted them to perfection before placing them between two chocolate biscuits. 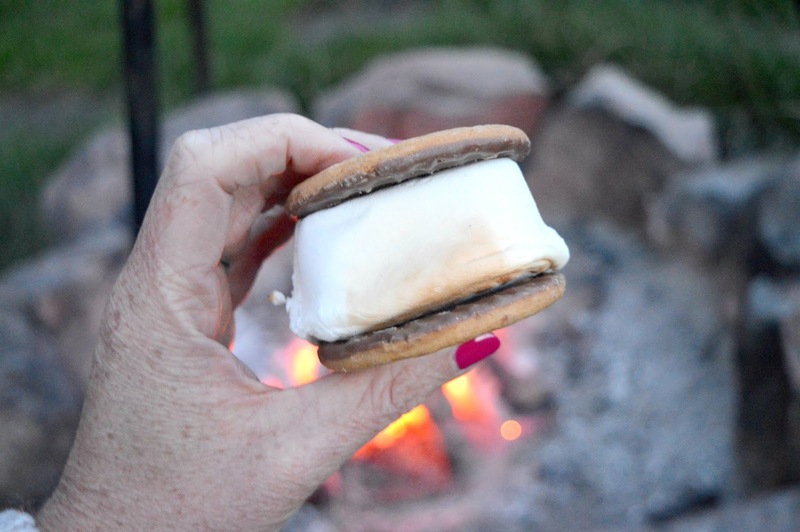 A very easy way to make s'mores without any of the mess, we squished the hot marshmallows between the biscuits and they began to melt the chocolate perfectly as we happily tucked in. Absolutely delicious but believe me you only need one, we were full to bursting! We had been so engrossed in our marshmallows we'd barely noticed how dark it was getting and the lights inside Holly Hut were inviting us into the warmth but we decided to sit out just a little longer to see if we could get a look at the famous Dark Skies. Rural Northumberland is famous for its star gazing and on clear nights you can see thousands and thousands of stars as well as a rare chance to spot the Milky Way. The best time to enjoy the stars is in Winter when the skies turn very dark and a stay at Hesleyside Huts would be perfect in the Winter time for a night of star gazing. We stayed up until around 11:00 pm and although the sky was beautiful with far more stars than we'd ever spot at home it never got truly dark so in the end we decided we were too tired to stay awake any longer and needed to retire to our bed. Simon's biggest complaint about our last glamping experience was that he was cold and uncomfortable so this time we were both fully prepared with layers of clothes to wear. I had brought a fleece lined tracksuit as well as knee high fluffy socks to ensure a comfortable night's sleep. We didn't actually need any of it! Holly Hut was so cosy and warm and our bed was even more comfortable and snuggly than our bed at home. We both fell asleep as soon as our heads touched the pillow and I got a solid 8 hours sleep! The one question I was asked over and over once I'd shared a photograph on my Instagram was "have you had a bath". 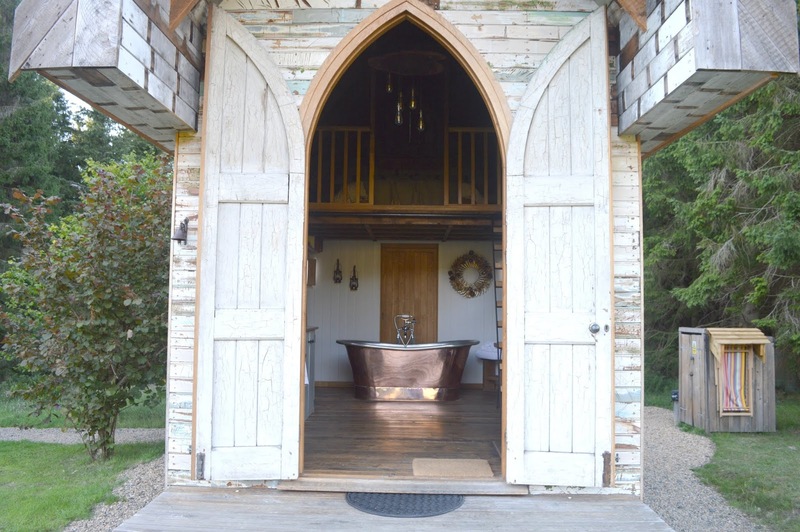 We've stayed in some very beautiful places with impressive bath tubs over the years and I'll admit I do tend to leave without hopping into the tub because as much as I love the idea I'm too lazy to run the bath! 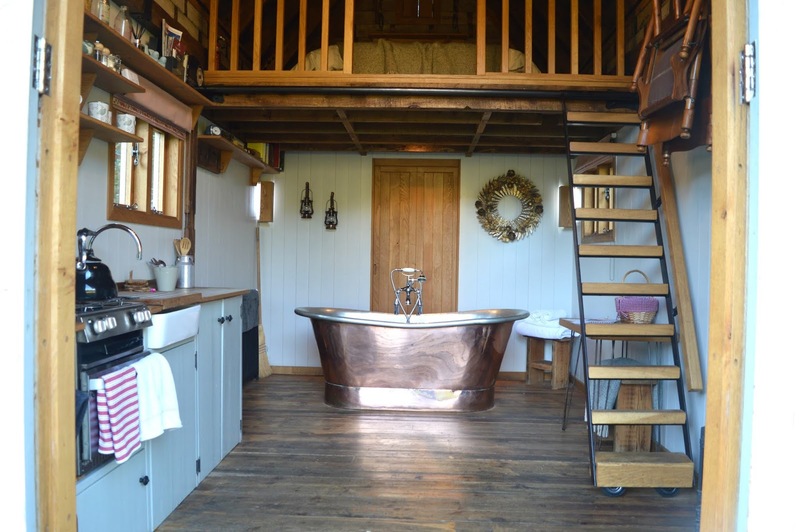 But I knew if I didn't have a bath in Holly Hut I would seriously regret it so as soon as I got up in the morning I decided to run myself a bath in the beautiful copper bath tub. I poured in a generous slash of bubble bath and began to fill the tub up. I hadn't really appreciated until I started how huge the tub was! It took a good while to fill up but once it had I threw open Holly's front door and sunk into the hot bath. The beautiful sunshine of the previous day had been replaced by grey skies and never ending downpours but sitting in the bath watching the rain outside was the most relaxing way to start a morning. As we'd wimped out of cooking the night before we decided to dip our toe slightly into the world of glamping by preparing ourselves some breakfast in Holly. We had brought some breakfast bits along with us and had every intention to rustle ourselves up some omelettes, however being the complete amateurs that we are, we completely forgot to take any butter for the pan! 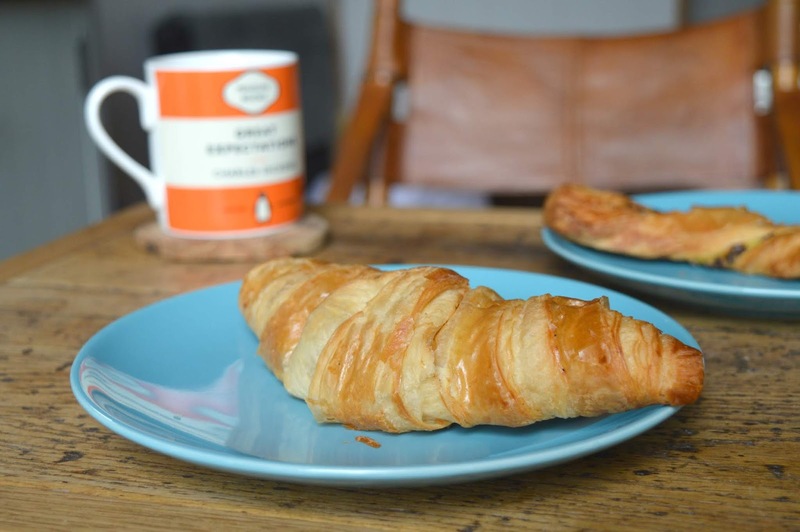 So it was a good job I had some emergency croissants ready! I think in future to save any breakfast mishaps we'd probably order a breakfast basket! 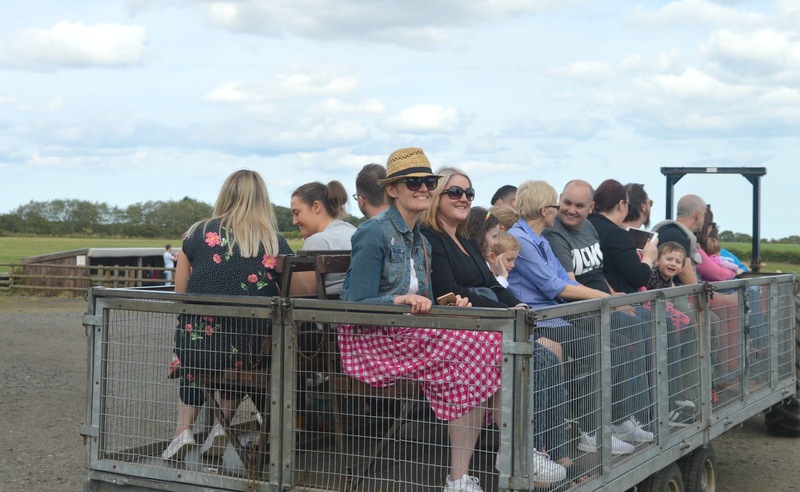 For £20.00 Hesleyside Huts will deliver a basket of goodies including croissants, local marmalade, eggs, sausages and bacon to your doorstep which, in hindsight, would have been a good idea! A very important part of sharing this adventure with you is to get Simon's honest feedback on Hesleyside Huts. As long time followers of mine will know, my husband isn't always the most willing when it comes to outdoor adventures, and as we were packing our bags to begin our journey he was muttering under his breath about having to "sleep in a shed". Our first glamping experience a few years ago he hadn't really enjoyed - mostly because we'd had to put the bed together ourselves (which lead to a few arguments!) and he spent most of the night having to put up with me going on and on about amazing it all was whilst freezing himself silly. So I am so so happy to share that he loved every second - he enjoyed the campfire, had a comfortable night's sleep and I even caught him sitting on the grass outside for 10 minutes trying to photograph a grasshopper! Anywhere that can bring the outdoor loving side of my boy out is a truly special place! We both loved our stay at Hesleyside Huts and were very sad when we had to leave, there is no doubt in my mind that we will be back!